We are selling our remaining stock on line! 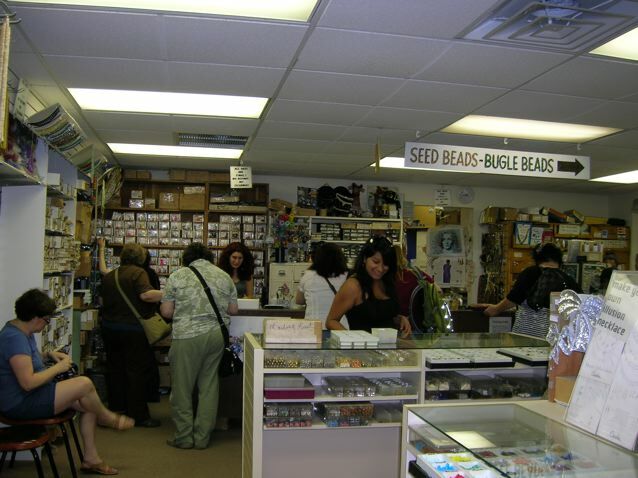 We have quite a lot of beads. Many that can be found nowhere else! July 20, 2014 Many New Items ! Check out the new items added to the website. 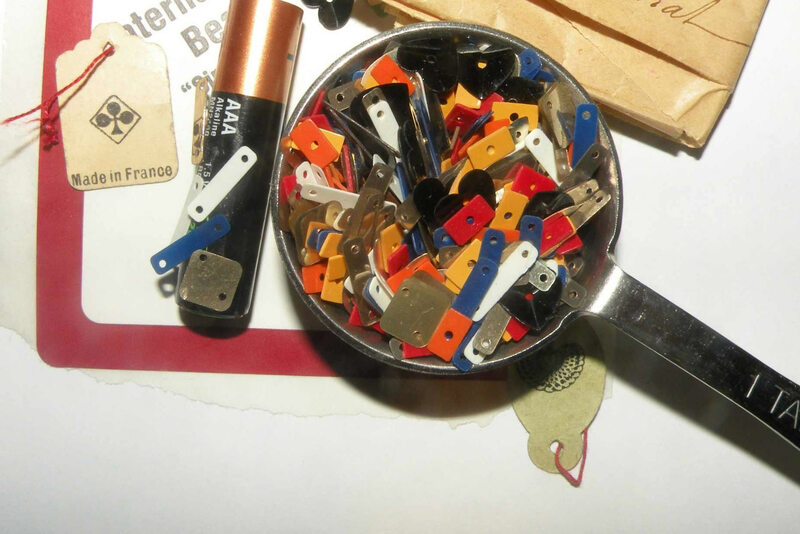 Five New Czech teasers, new vintage items and more to come. 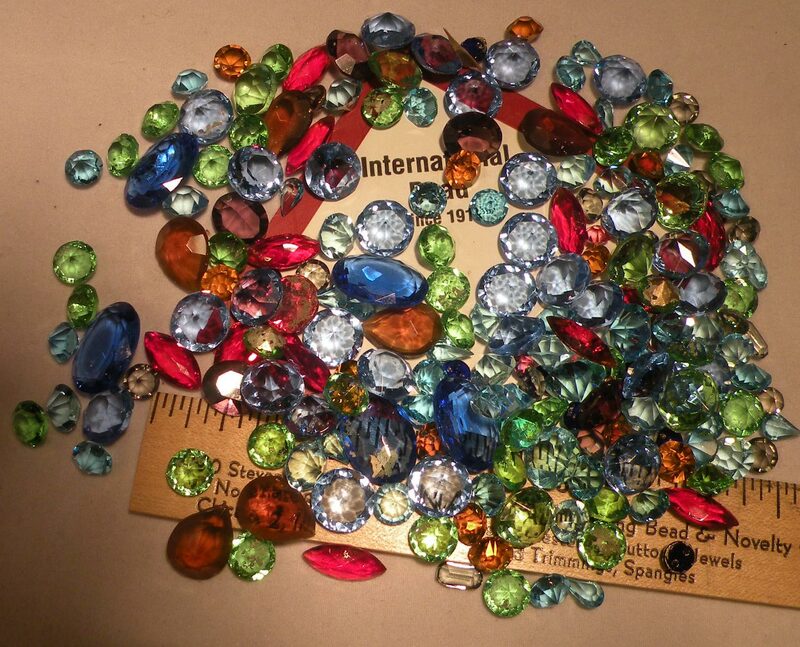 14 Blue Zircon 15 Amethyst, 16 Sapphire, 17 Crystal, 18 Fuchsia, 19 Light Siam, and #20 Red Topaz! 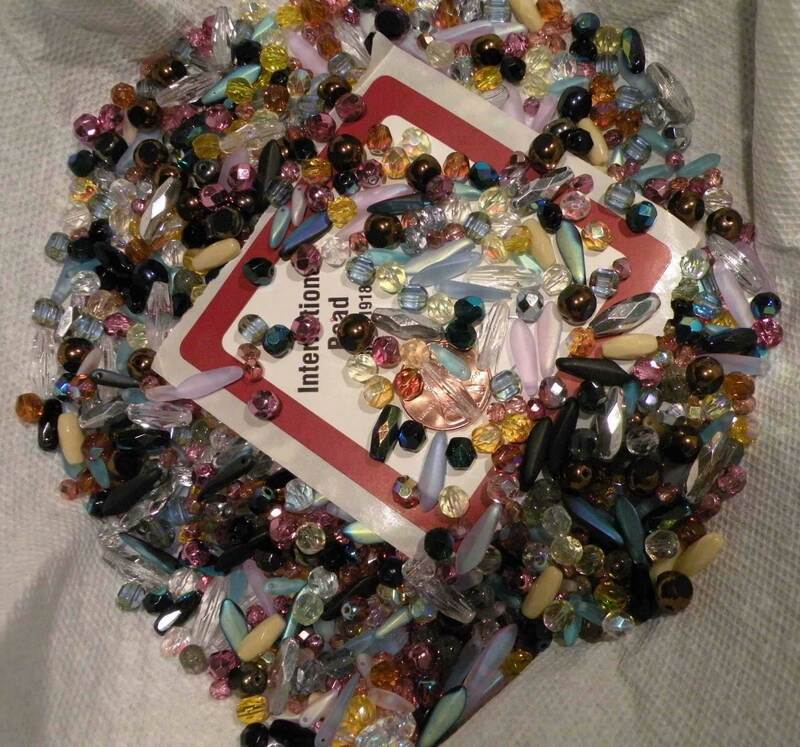 All are Swarovski, All are First Quality The Price is $12 per package. 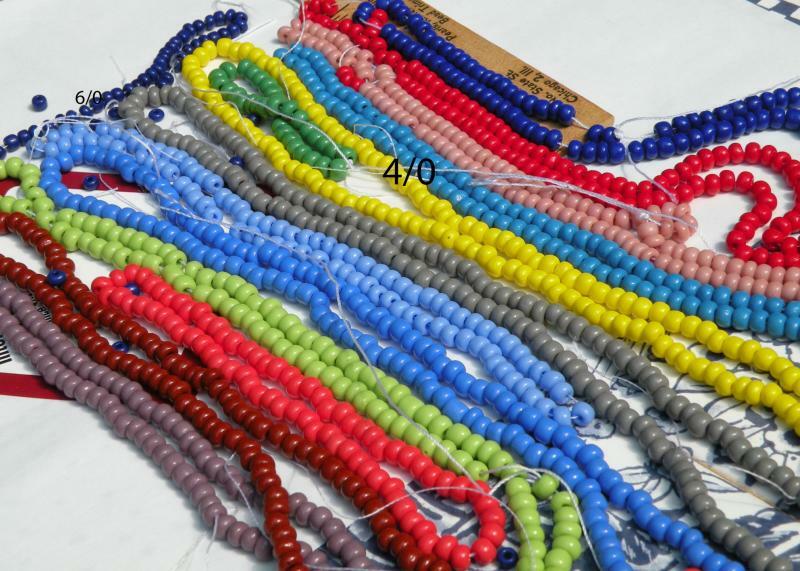 300 beads per package. 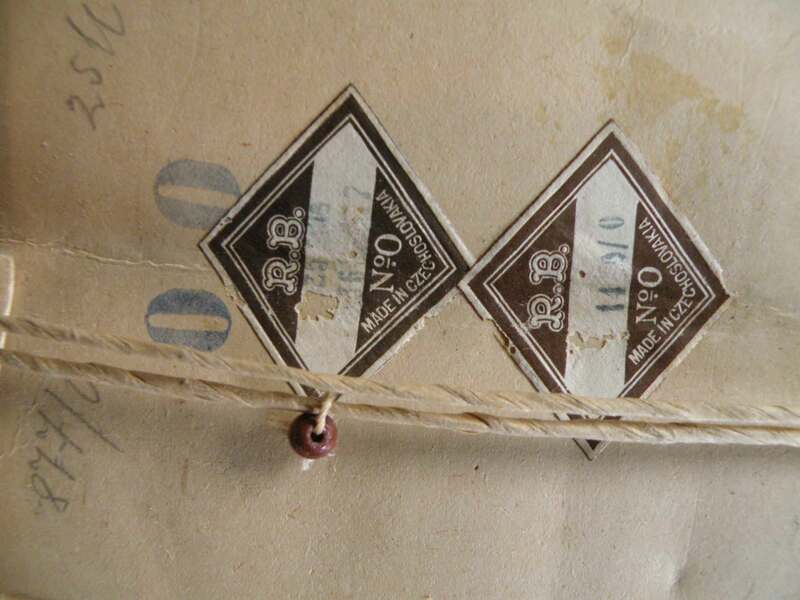 This is a photo of a typical package. Email to Order. 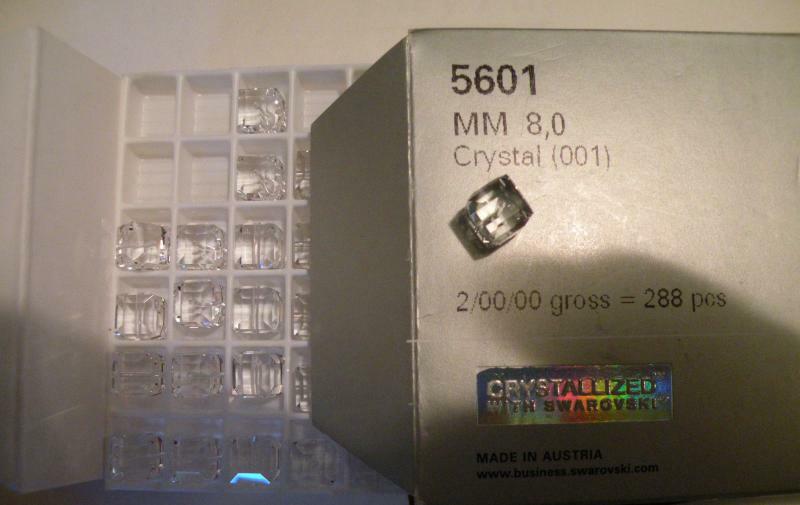 The 5601 cube offer ! 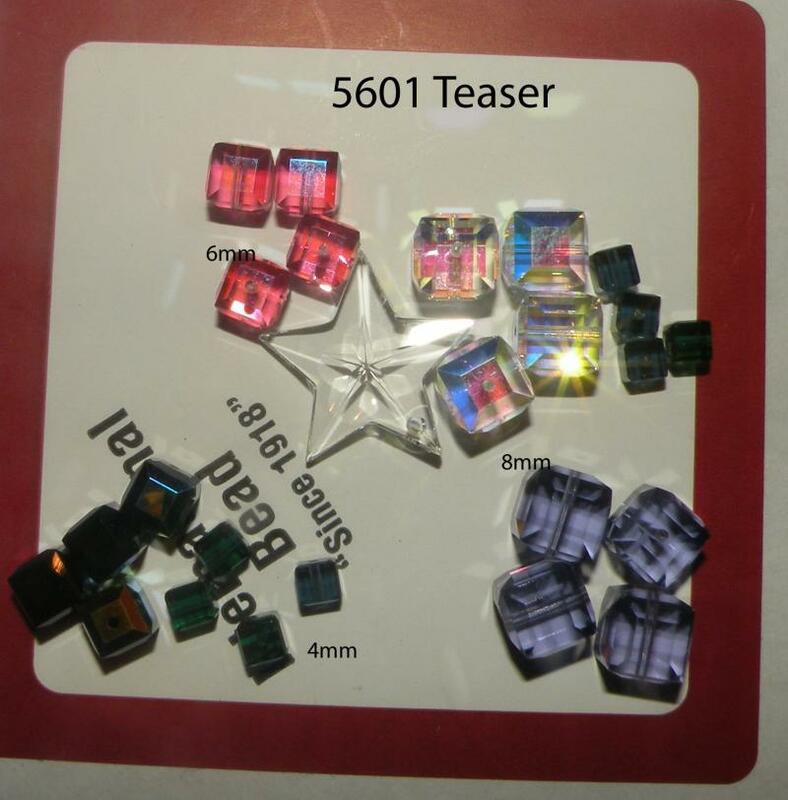 5601 Cube Teaser ! 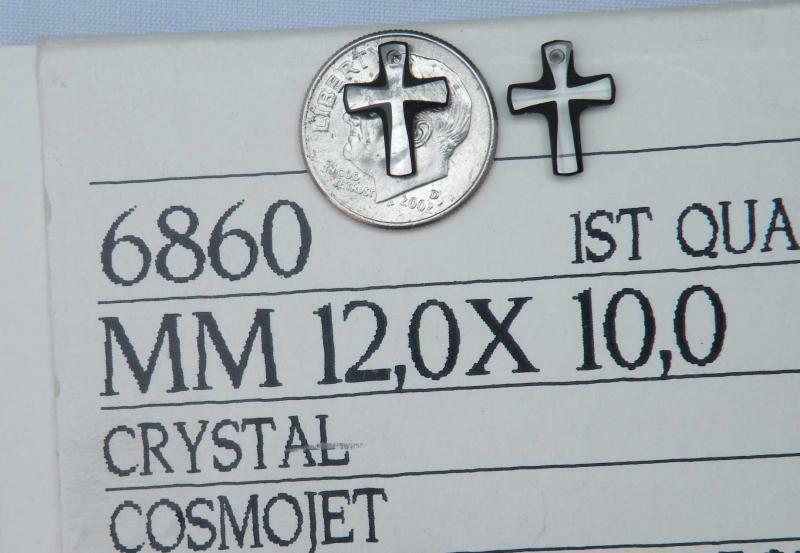 Plus a 20mm crystal star for good luck! $12 plus shipping. 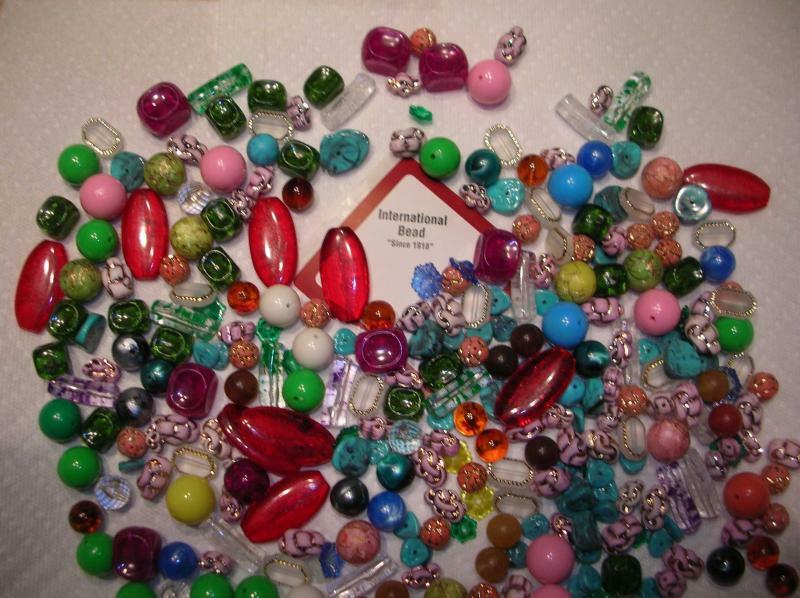 Mixed bag of Great Beads. All Czech, some old, from the 60’s Most young. 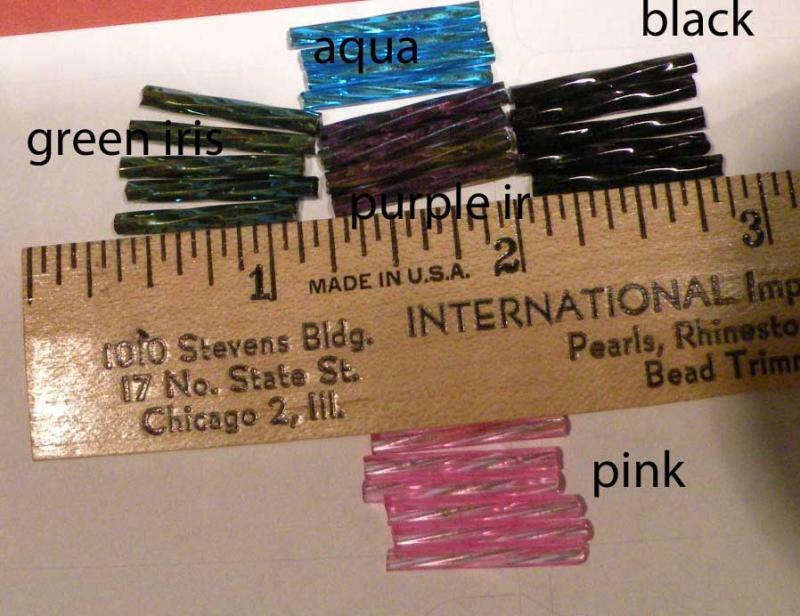 3 ounces of large Glass seed beads fancy colors. Size 4/0 and larger. 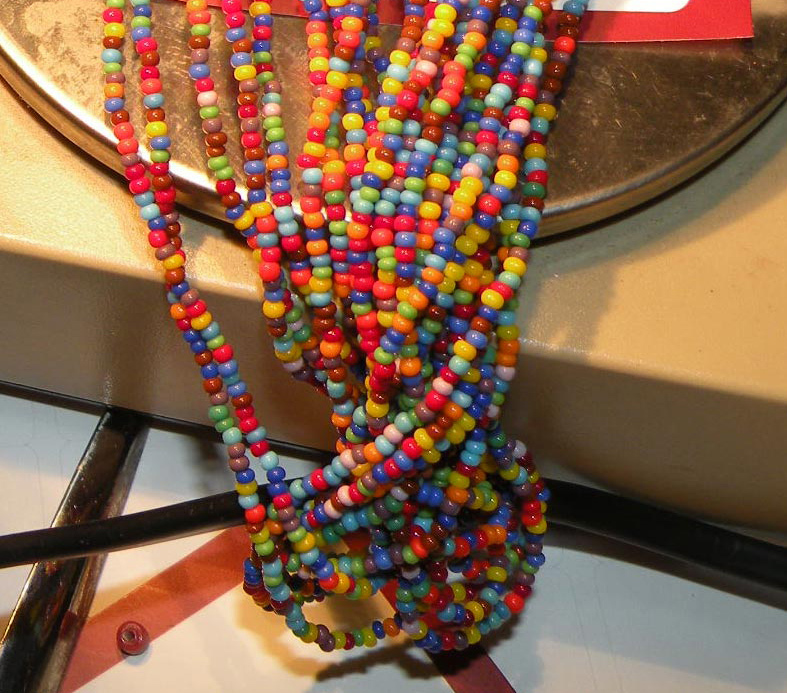 Some white hearts, Some Tubular All Bright Colors, Typical bag strings to 100 inches. 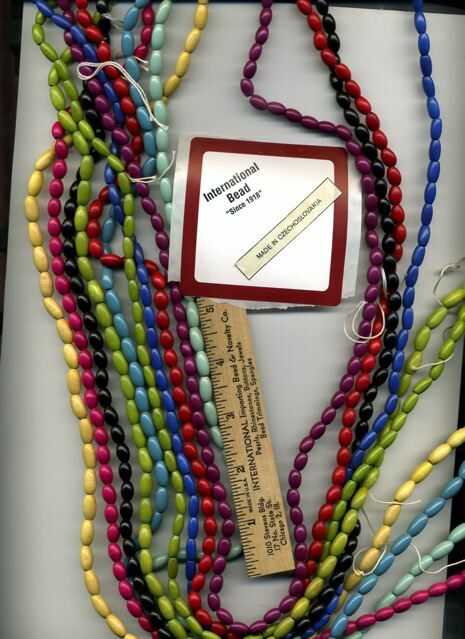 Includes 4 simple clasps and 144 inches of cord for stringing. $4 per bag email to order. 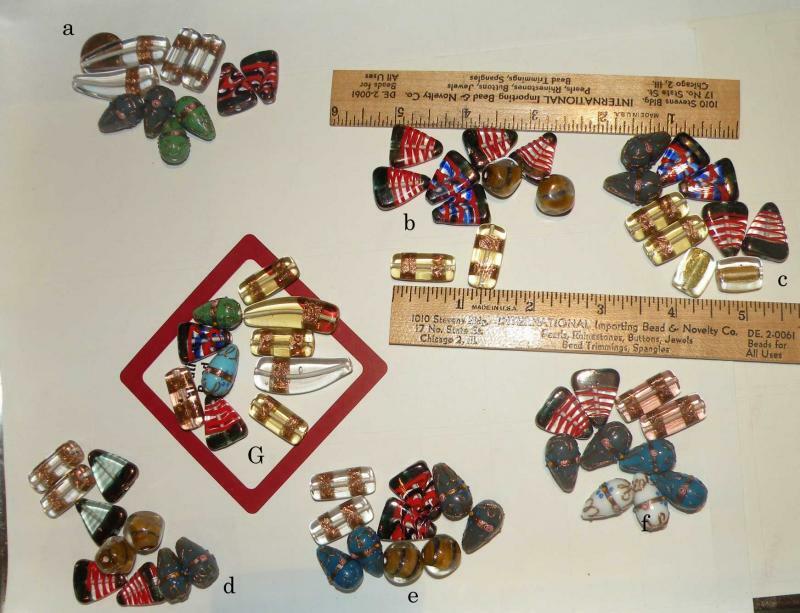 plus 6 pair of channel spacers with loops $10 plus shipping. 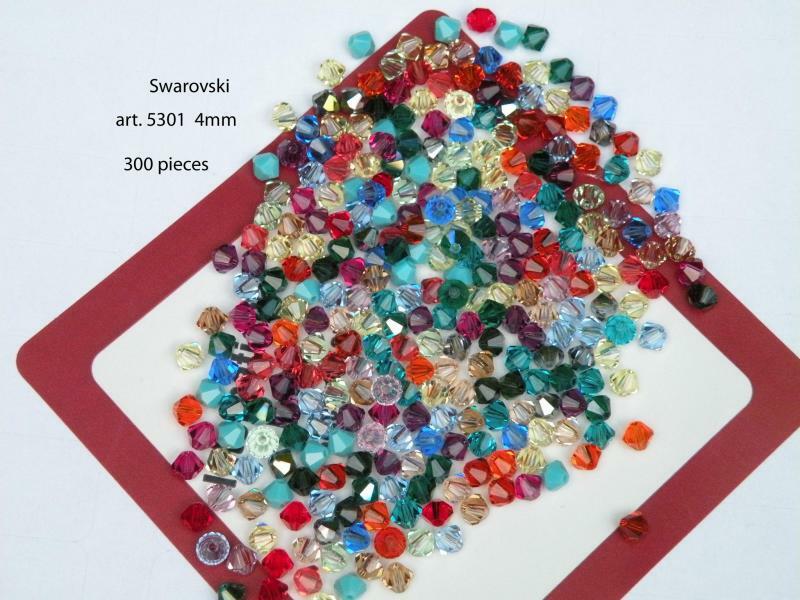 Swarovski art 6202 heart 10mm crystal.1 dozen pieces for $4, plus shipping. 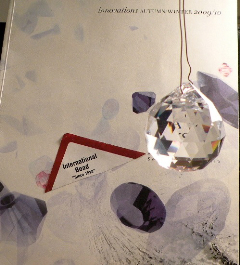 Swarovsk Cross -crystal with a black trim. Small. 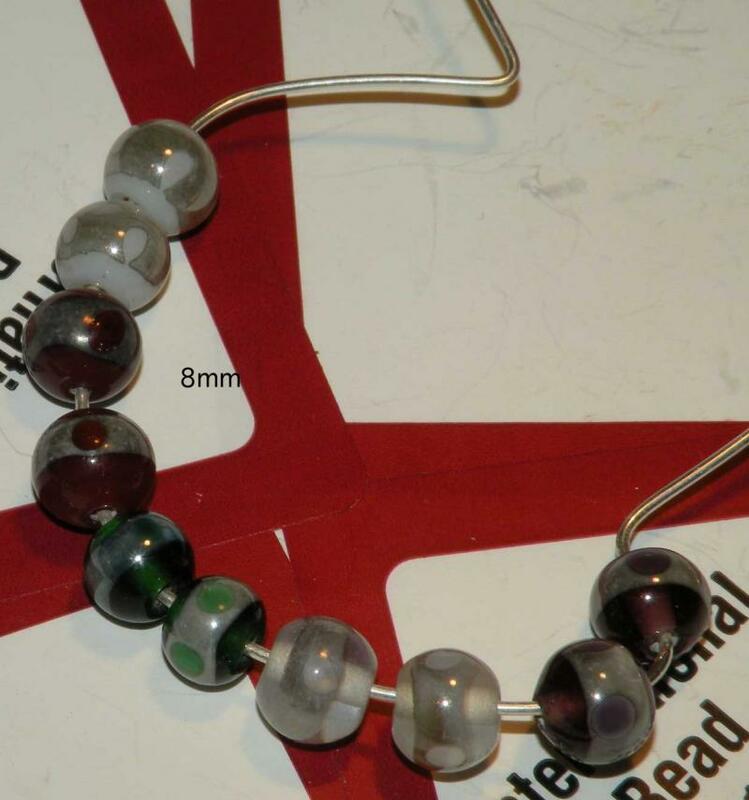 2 pieces for $3.00 plus shipping email to order . 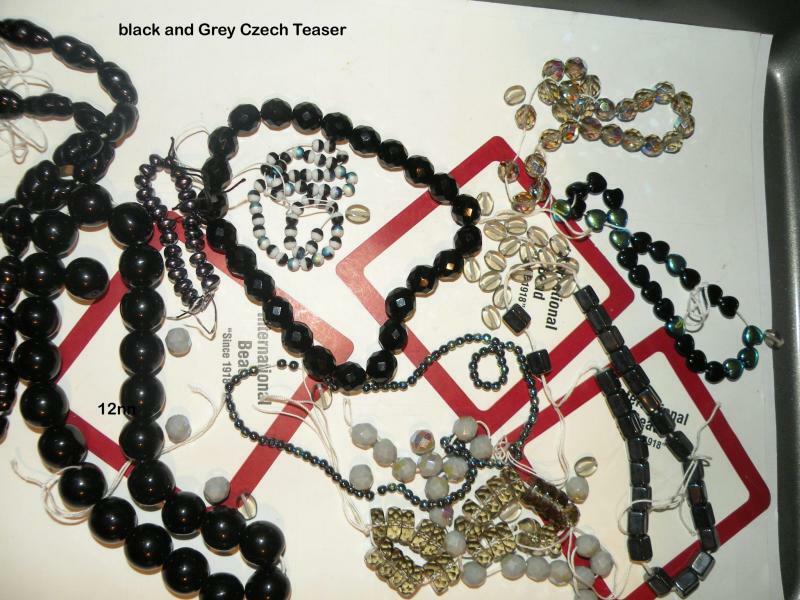 The Fab Gear Czech teaser, gear beads, large drops donuts, Triangles Hearts very colorfull everything in the photo. 12 items, 12 dollars plus shipping. 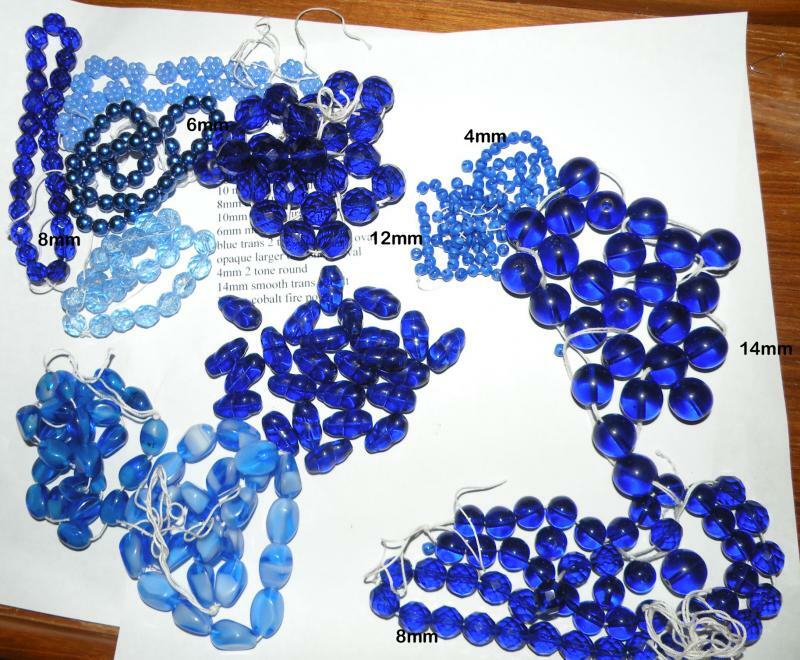 Shades of Blue Czech Teaser - All Blue All Glass and All Czech, 12 different beads- everything in the picture $12 plus shipping email to order. 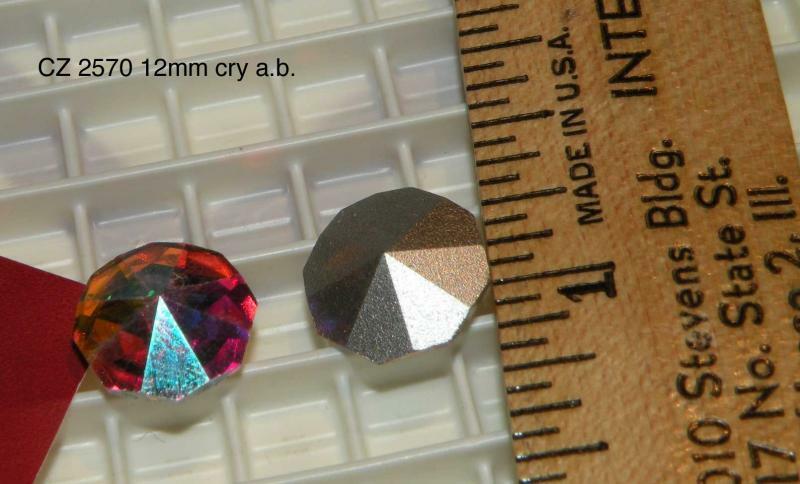 Swarovski flat-back Stones in "Hot Fix"
Sizes ss5 up to ss42. 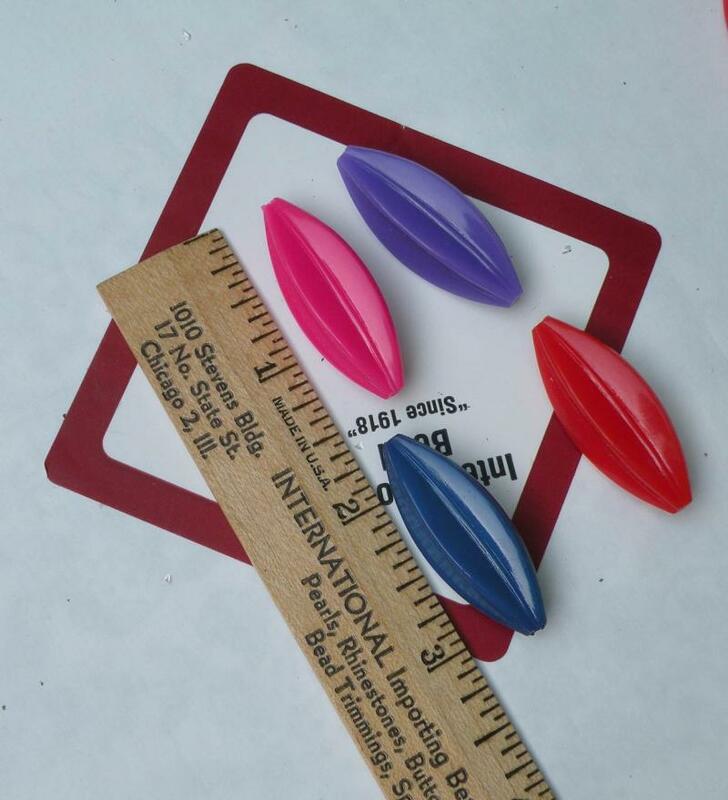 many colors, great prices. 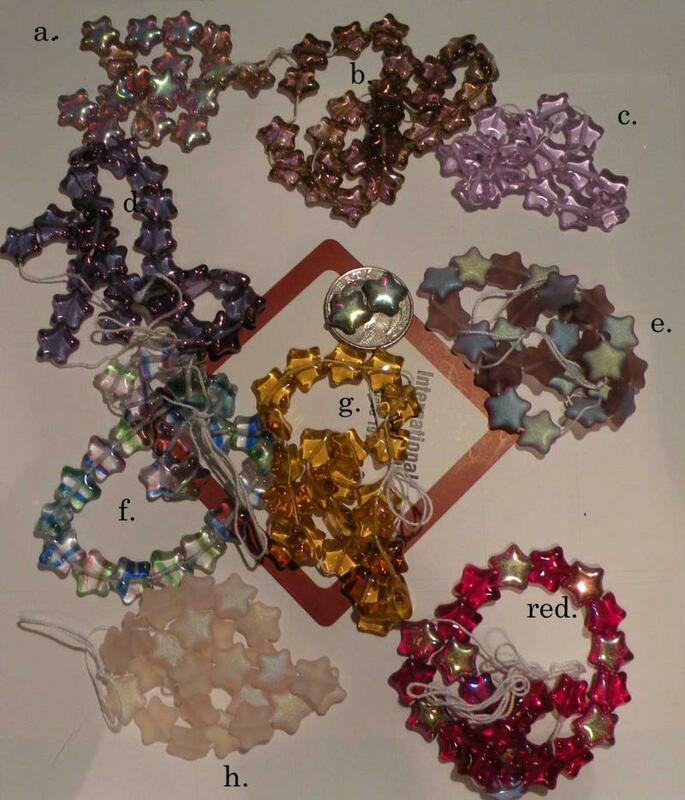 Rhinestone Rhondells , Rhinestone Banding, Trims and Balls. Seed Bead Offer of the Century. 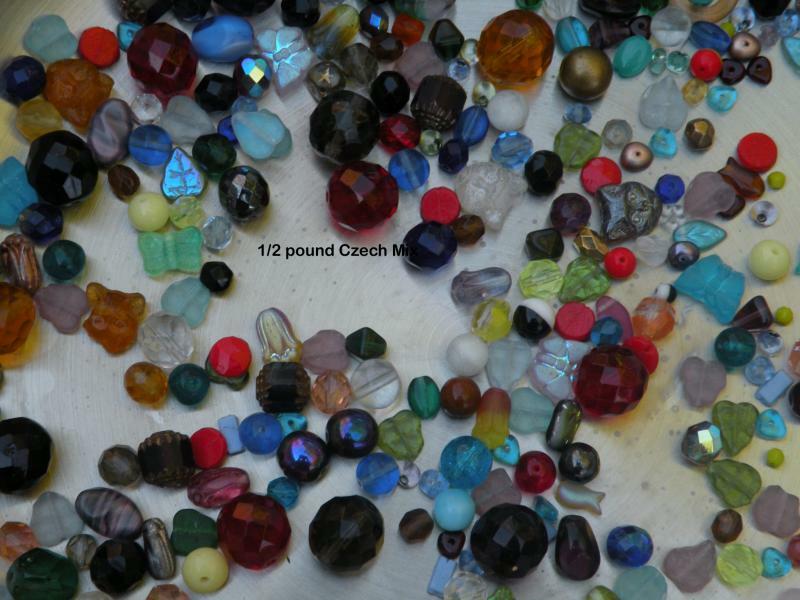 20 bunches of seed beads, sizes 11/0 and 10/0 20 assorted colors, all strung, first quality Czech seed beads. Some 2 cuts or 3 cuts. 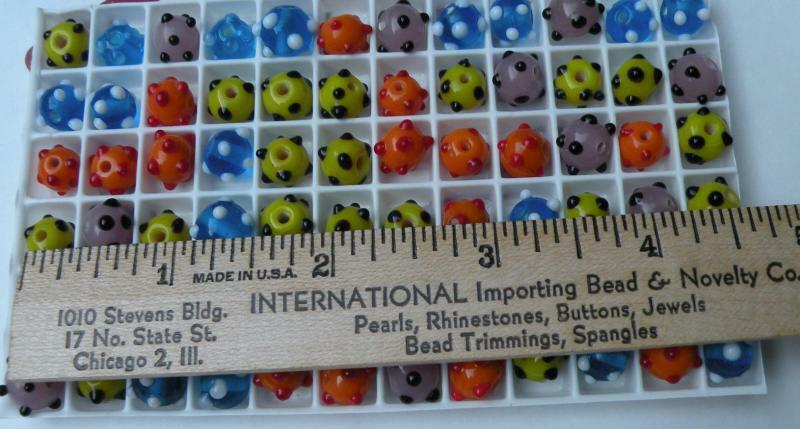 The cut beads may be size 9/0 . 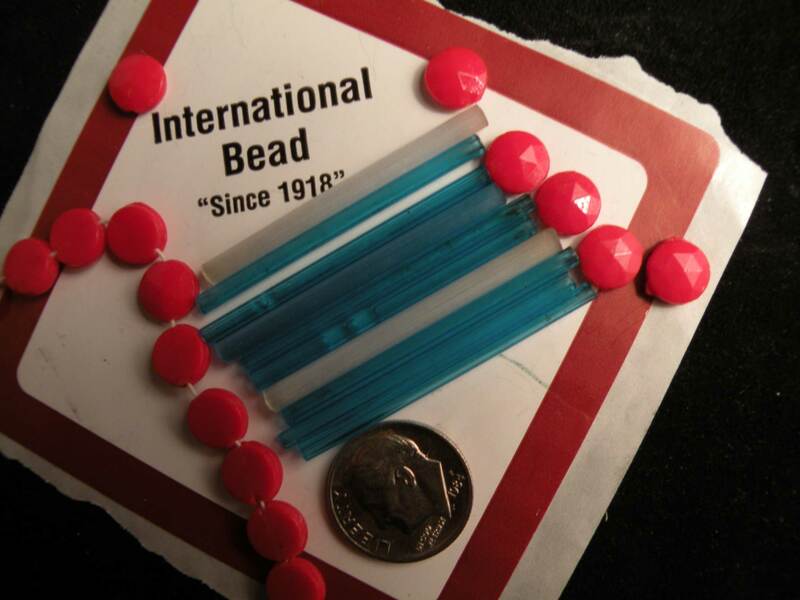 or smaller ( or larger) As of today each order will contain a package of 3 old bunches of pre war ( 1930s) 3 cut beads. 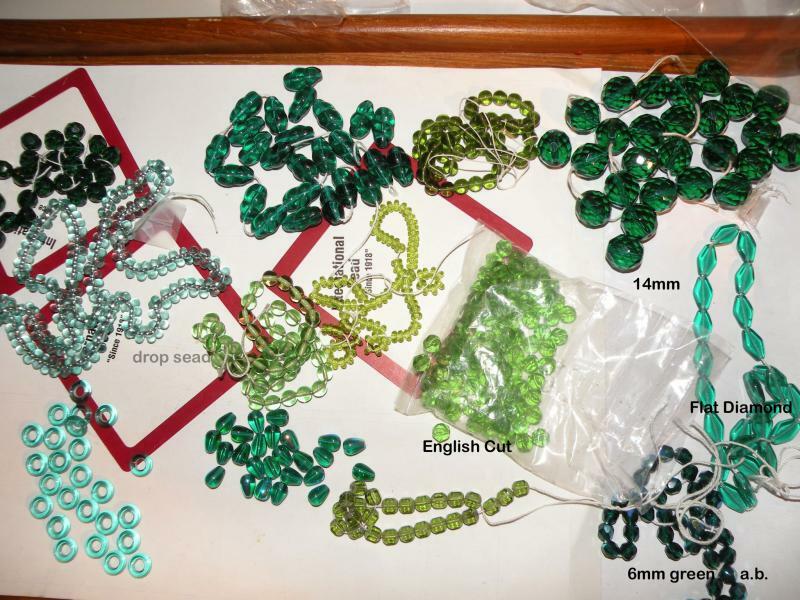 Each bunch contains 1200 pieces, so there are 3600 beads per package. The price is $25.00 plus shipping. 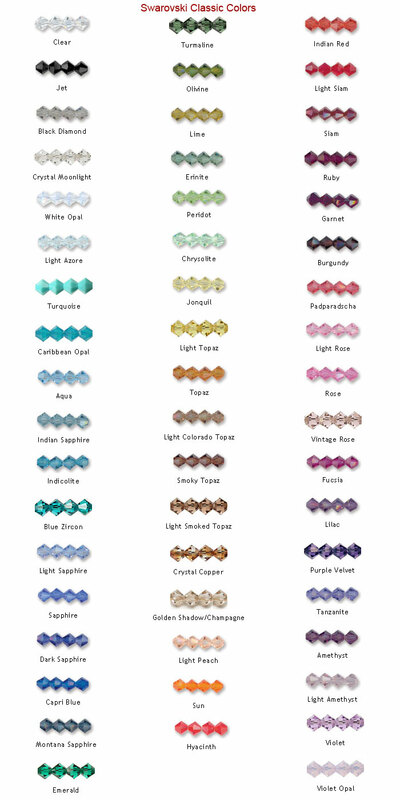 Email us at beads1918@sbcglobal.net to order or for more information. 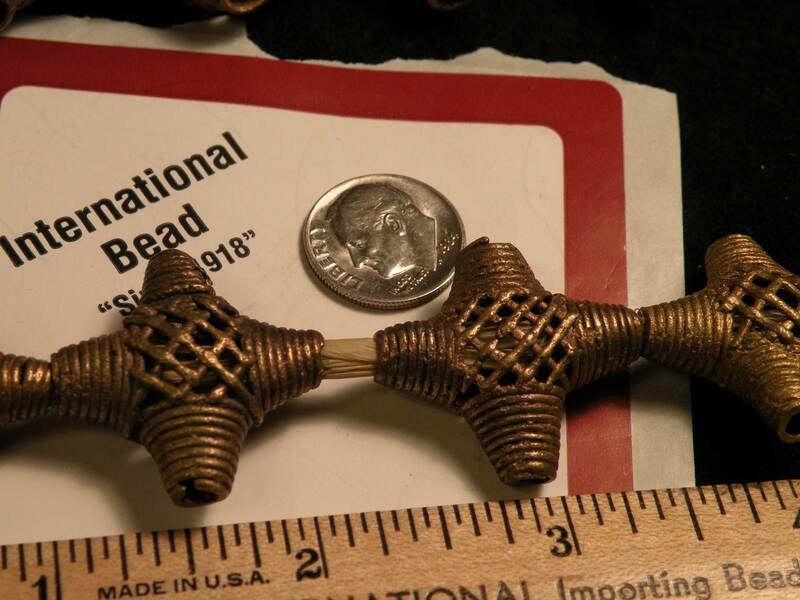 Strung Czech Bugle Beads. 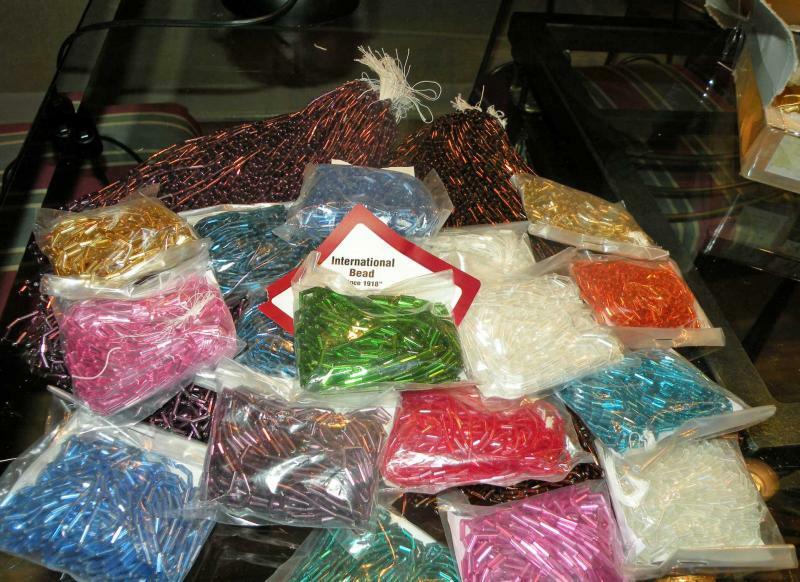 15 bunches of 12 strings 20 inches long 15 different packages for 25 dollars. Mostly size 3 some size 2, 15 different colors. $25 plus shipping. 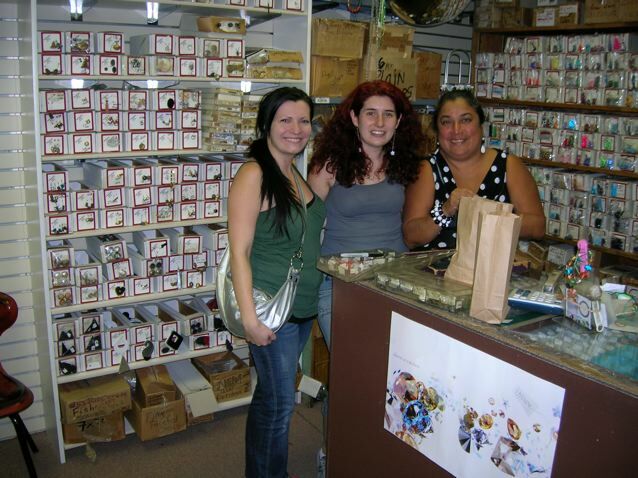 We pick 15 different packs and put them in a box and send them to you! The Hannah and Sarah Vintage Glue on Mix! All glass, all old , and all interesting. From Germany, Czecho-Slovakia, and Japan. 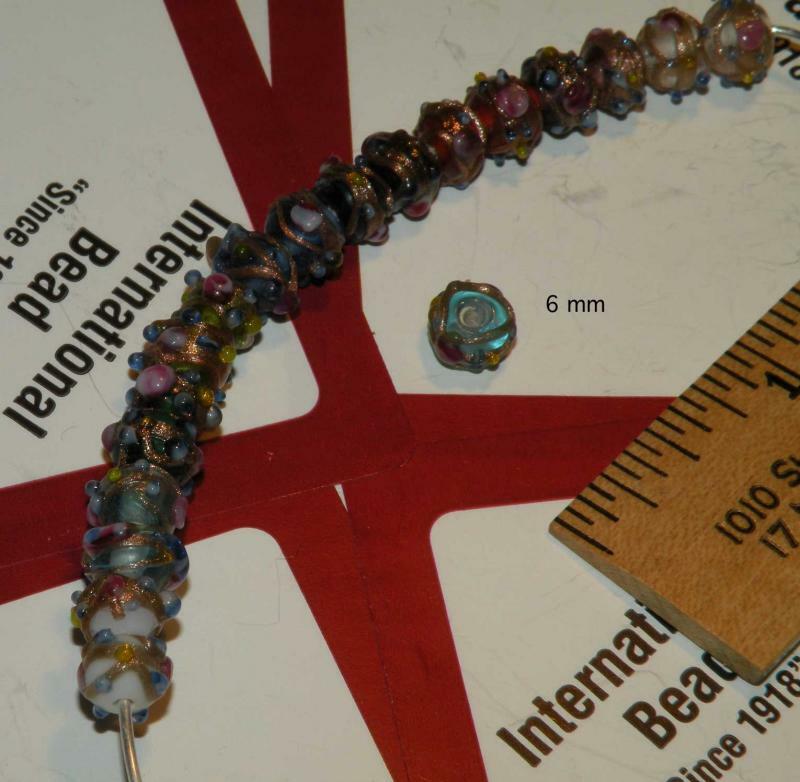 glass fish from India, 20mm long, 10 mm high, drilled along the length of the bead. 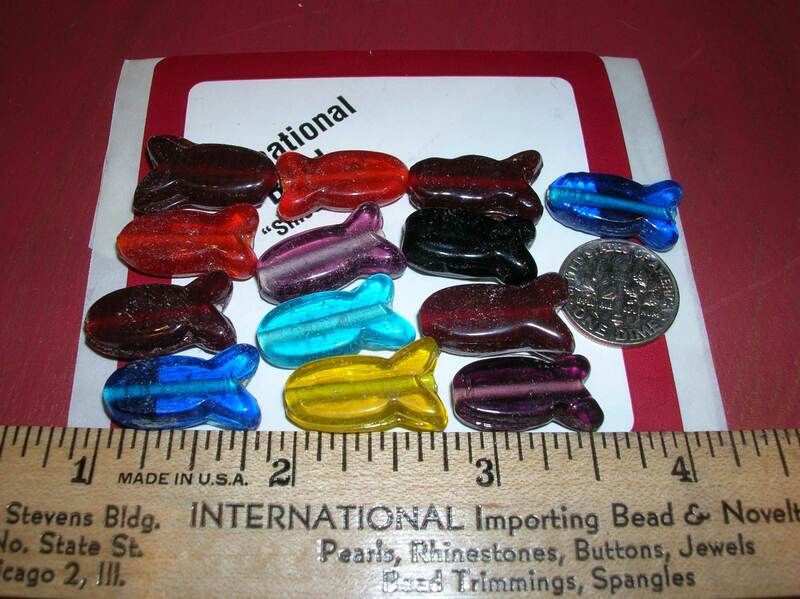 multi colored bag of 1/2 pound, $7.50 plus shipping, approximately 110 fish per 1/2 pound. lacquer painted bright colors. Or plain wood with a clear coating.. One and a quarter inch domes one half inch high (32mm around and 13mm high) of very high quality wood. Made in USA 8 pieces for $6. Name your colors according to the letters on the photo. 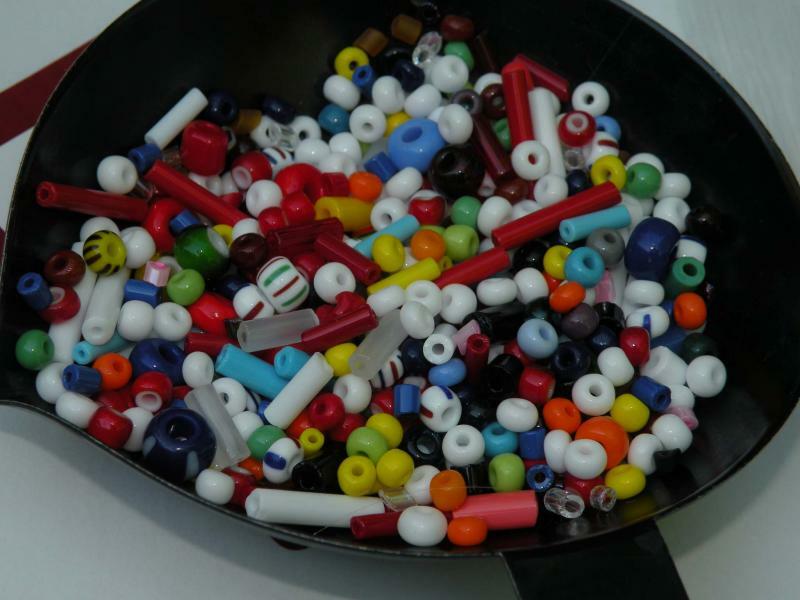 Round Beads -bright colors. 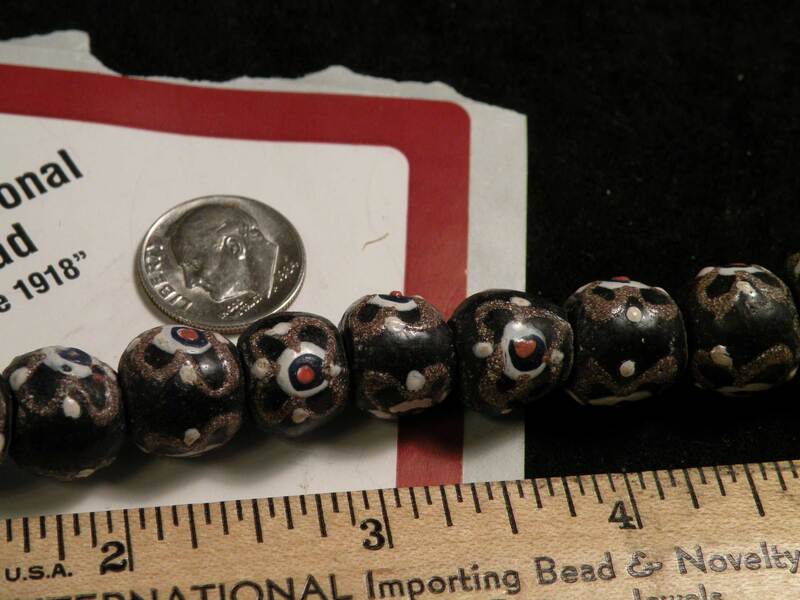 #909 These beads are best described by their photo. 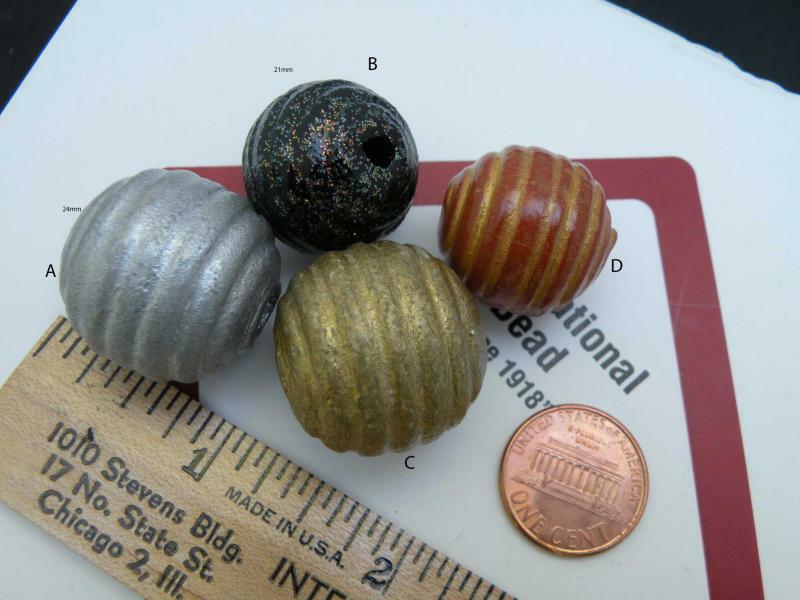 They are approximately 1 inch around, but not perfectly spherical. 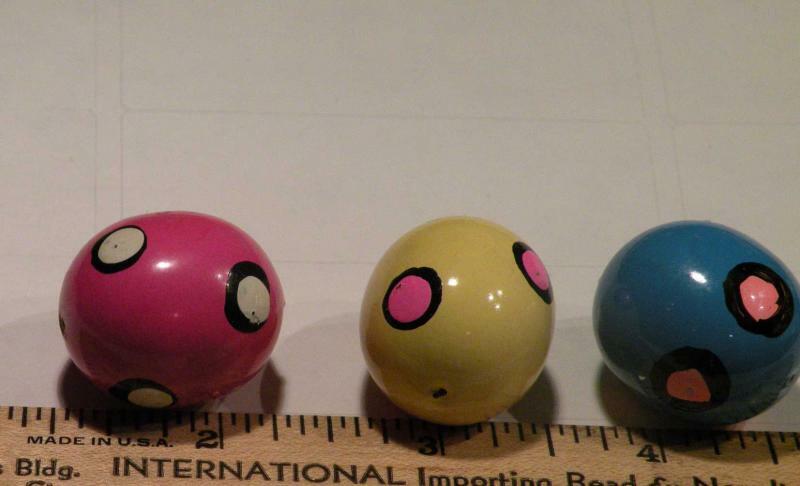 They are hand painted of some unknown material- maybe wood. I am not sure. 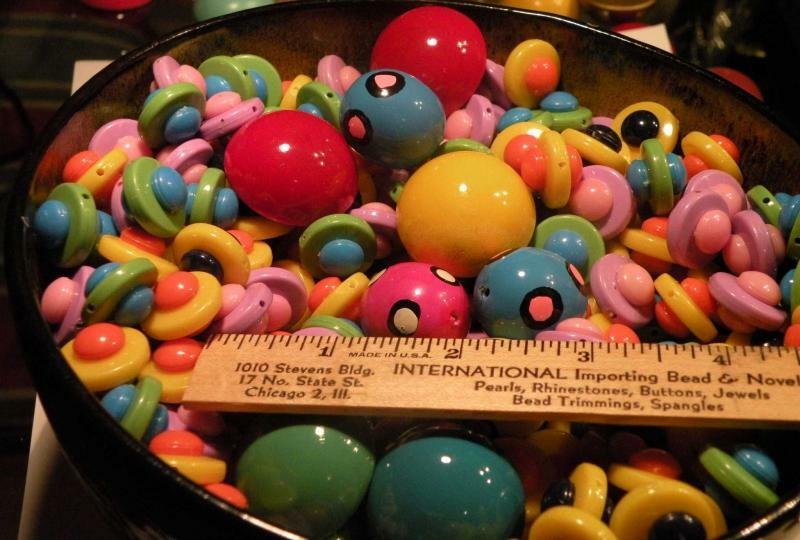 Each one weighs about a quarter ounce. 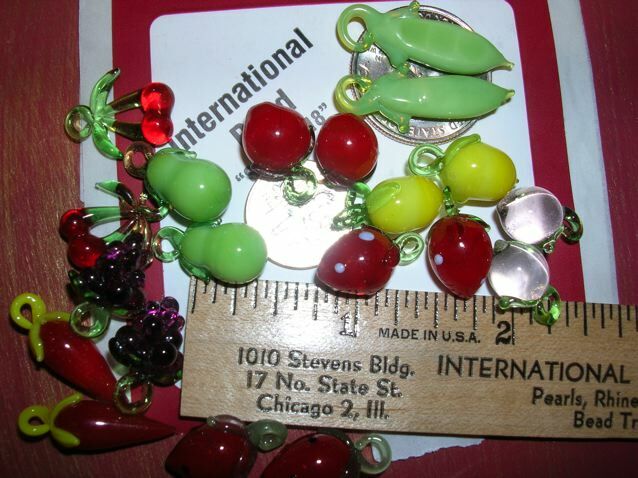 From the 60’s $7.50 a dozen mixed colors. Email to order or for any questions. 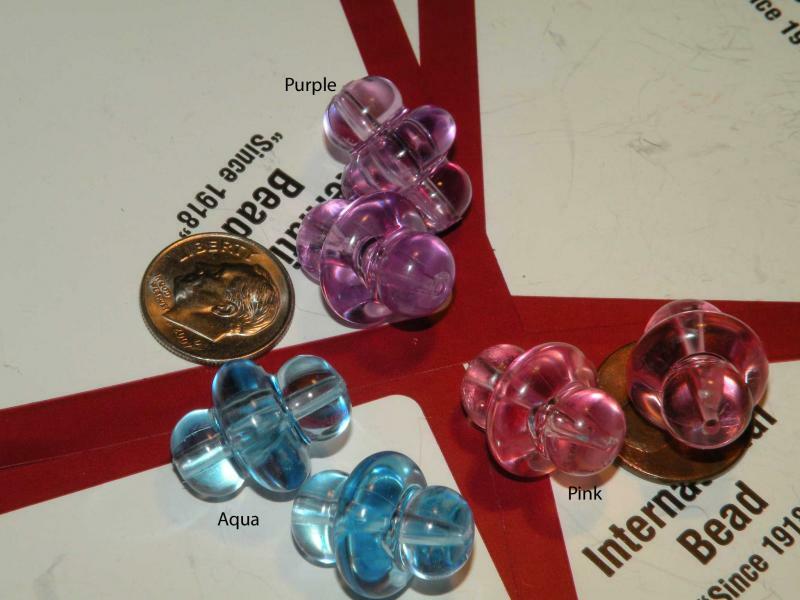 Space Station Beads Transparent Plastic Space Stations. 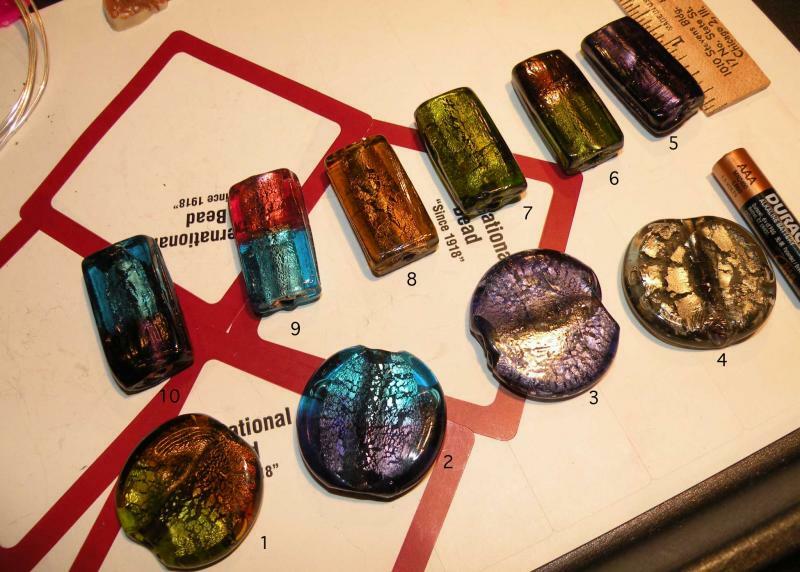 they are 17mm long and 13mm thick. 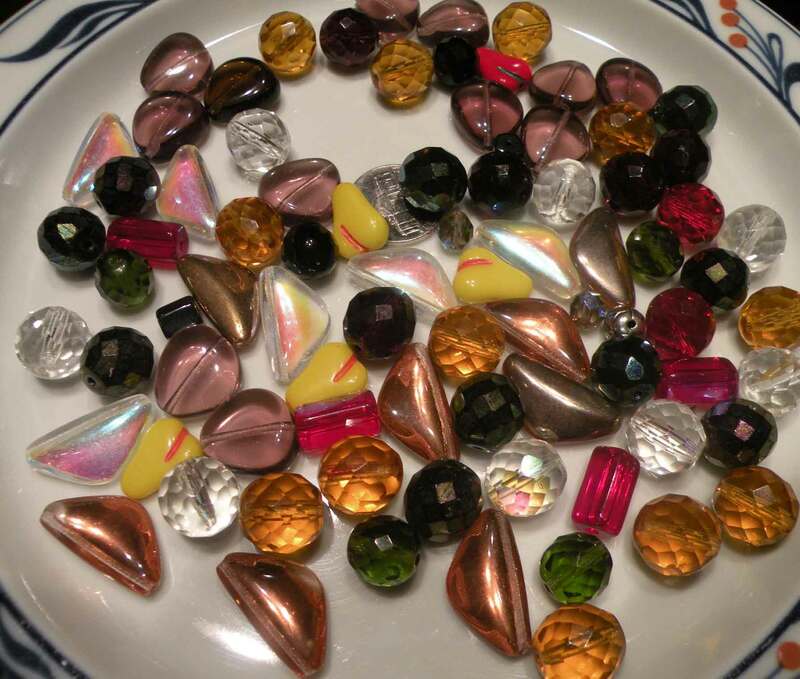 20 pieces randomly assorted for $3.. 50 pieces of a single color for $6. 50 string out to 33 inches . very light weight, ideal for outer space. 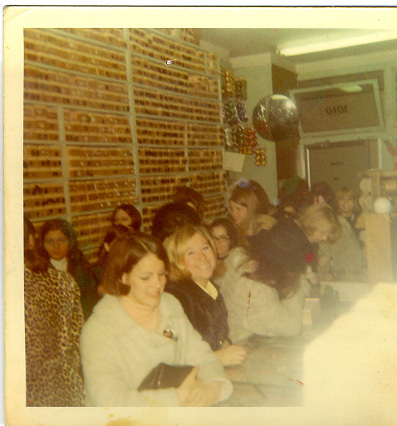 International Bead was what many called an "old fashioned Bead Store". 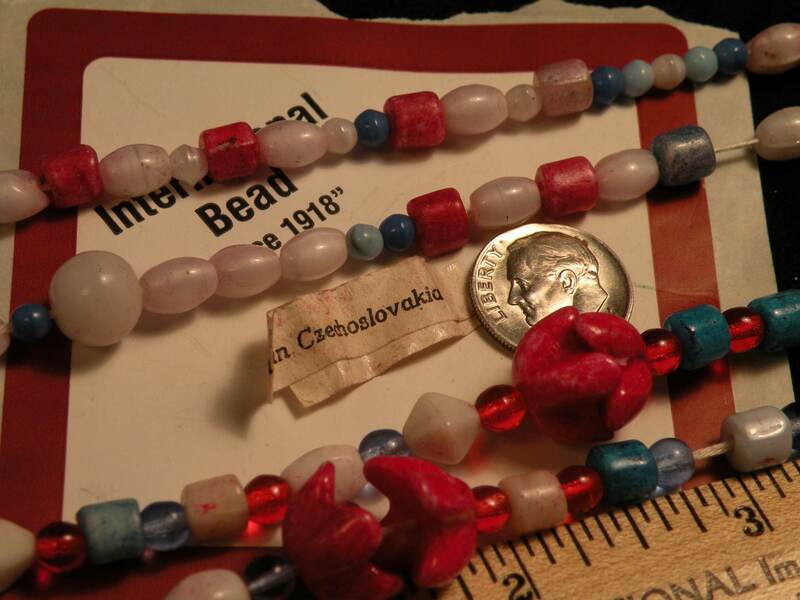 We have a lot of beads, collecting them since 1918, we have things that can be found nowhere else. 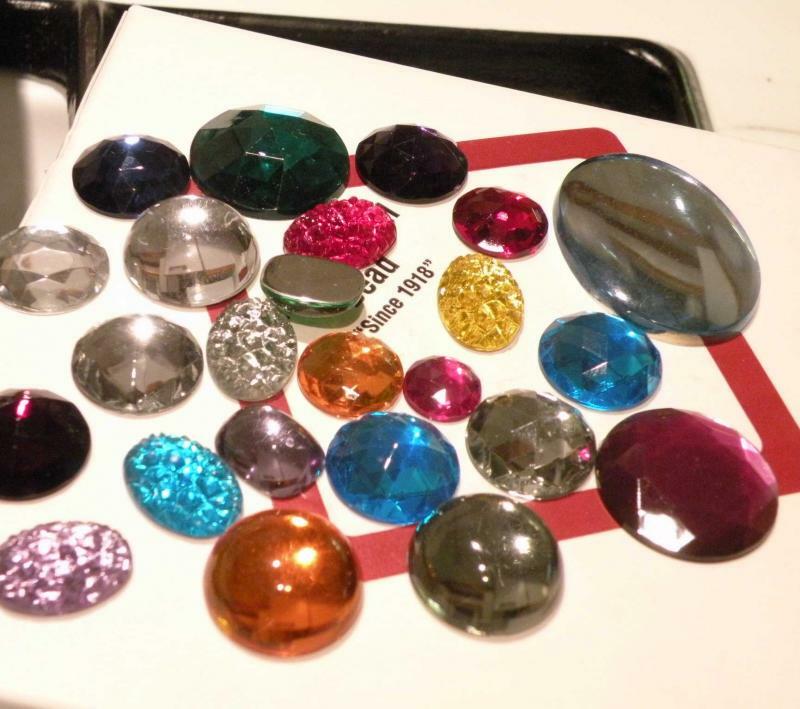 Acrylic Flat Jewels with a silver foiled backing. BY THE POUND! Many Shapes Some from the USA Some from Europe. Some from Asia. 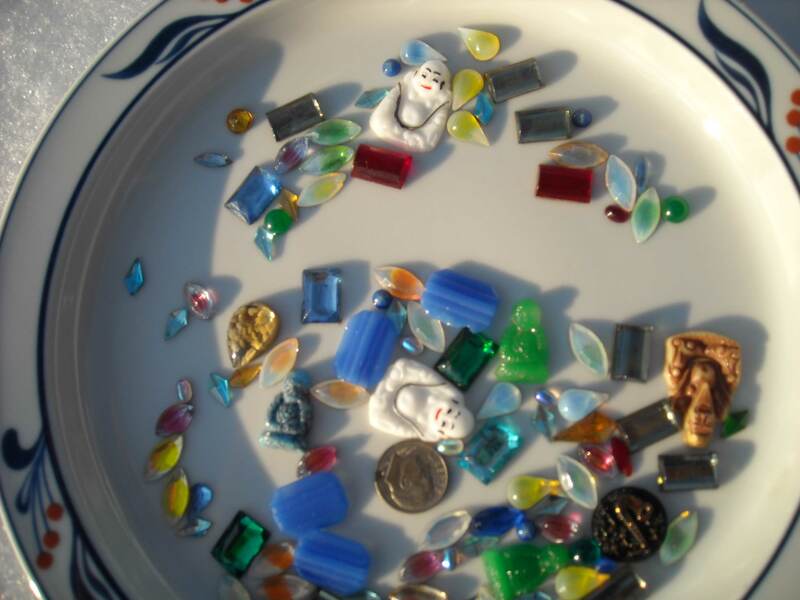 A regular United Nations of Plastic Jewels. 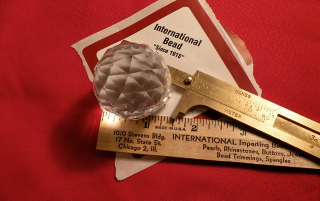 From 11mm to 40x30mm, smooth and faceted and great for every kind of project. 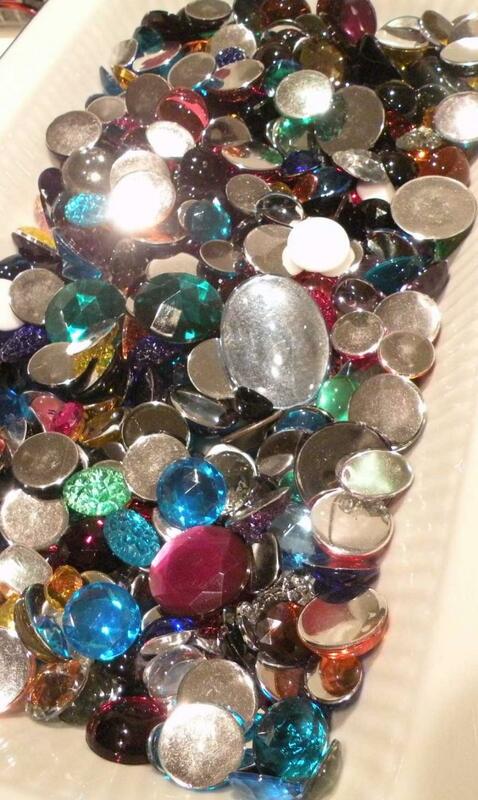 There are many unusual colors and styles in this mixture. Ideal for lining a treasure chest. $12 per pound. 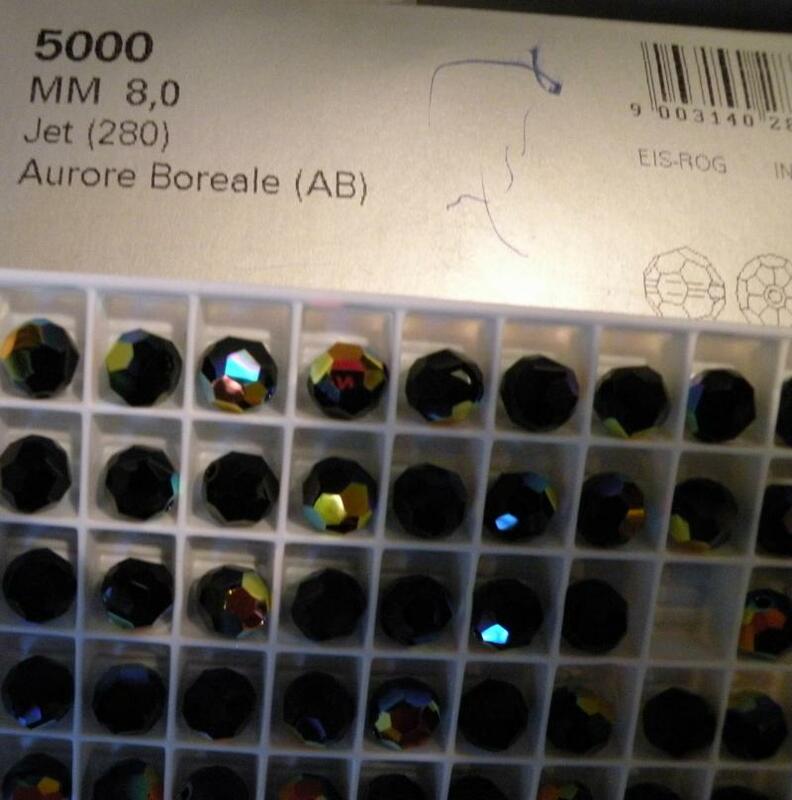 MORE ACRYLIC JEWELS HERE! 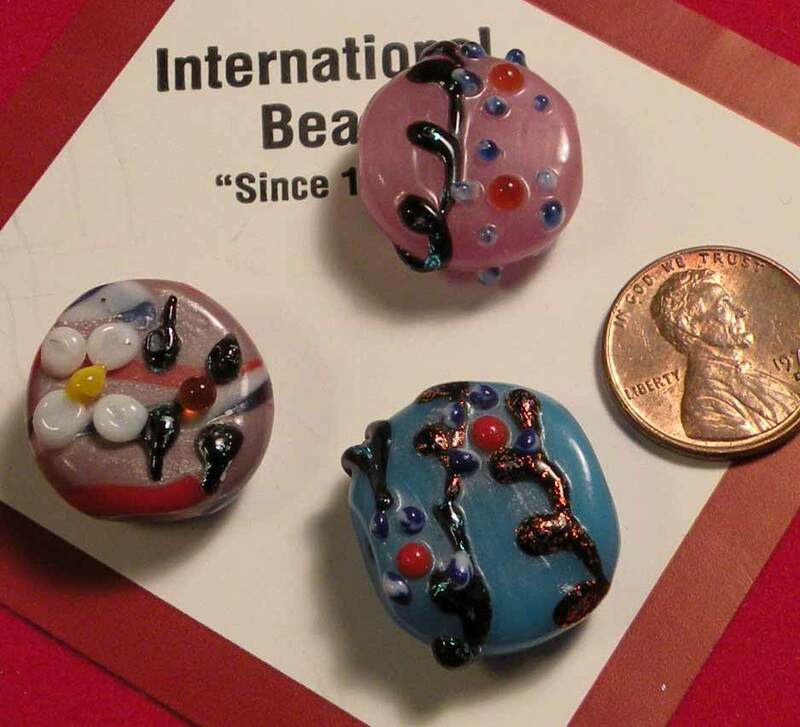 Czech Lampwork beads 6mm These are Czech, not any kind of imitation. Somehow the colors and styles mixed them selves up. Rather than sort them They are for sale at a low price, mixed at random. $3 per dozen Email to order. 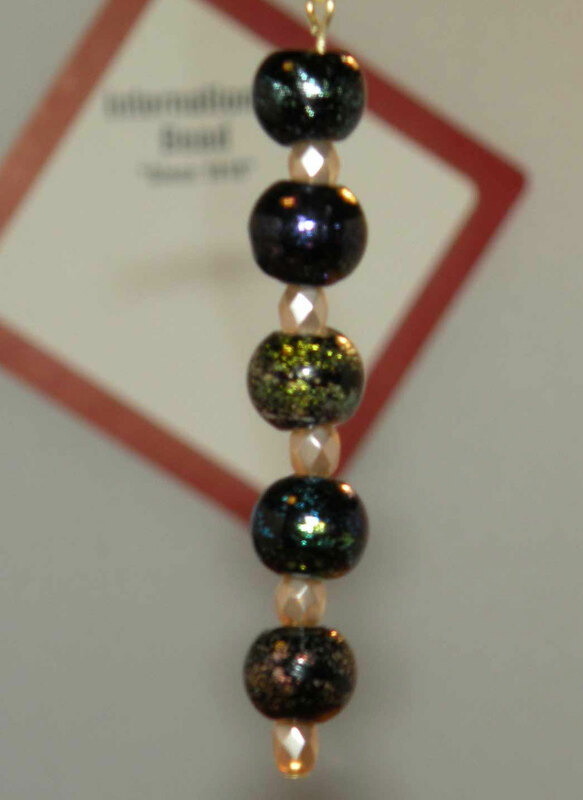 Large Ceramic Beads with a brushed finish, 21 mm black iridescent or brown, 24mm gold or silver. 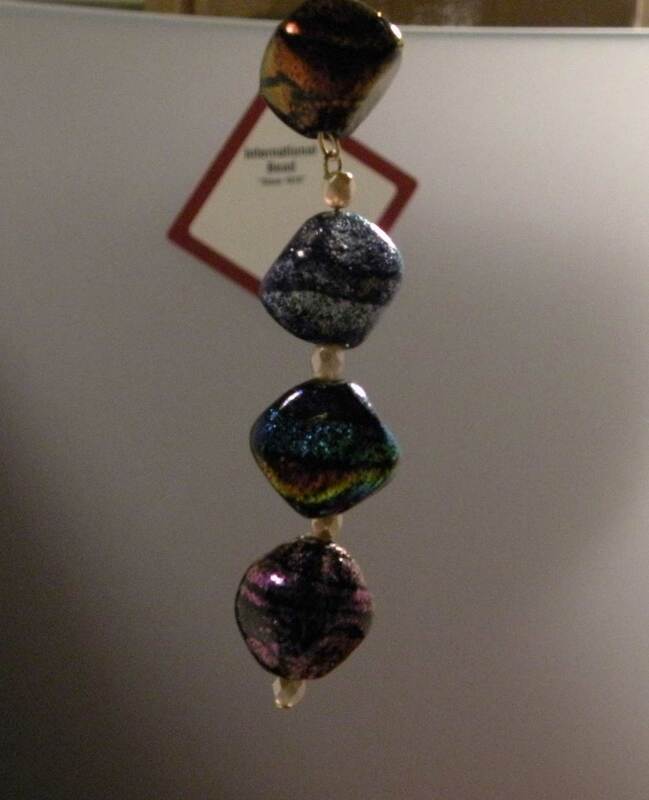 Very solid, it takes a hard wack from a hammer to break these beads. $5 per dozen. 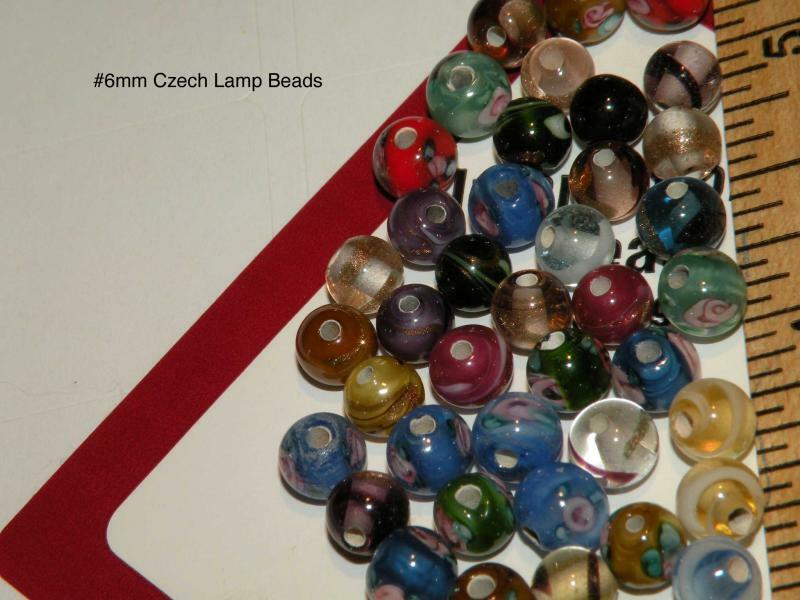 Order by letter A, B, C, or D.
All Czech Glass. 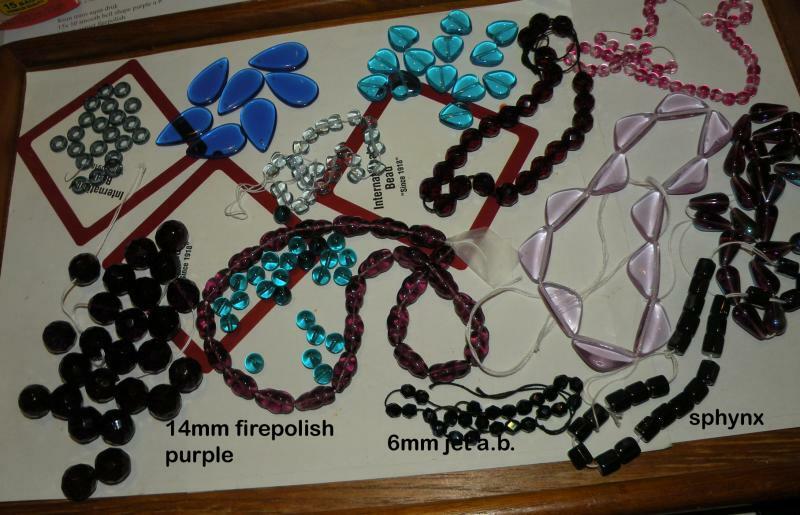 Fire Polish & Smooth Fancy Beads, A random mixture of 12 different items, the smallest are the 8mm clear gray a.b. as in the Photo. 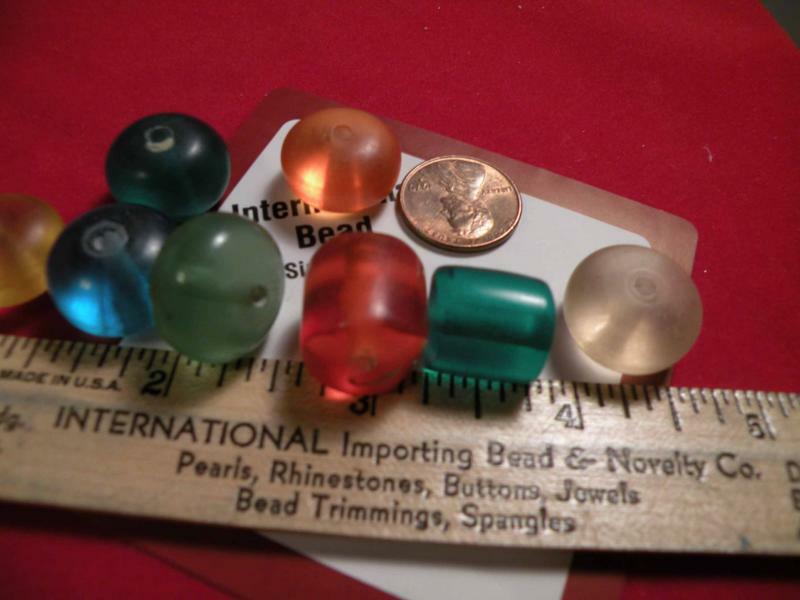 The photo above shows a typical bag 1/2 pound, $12.00 plus shipping . the ones that look pink are actually red. Click on the picture for a close up view. 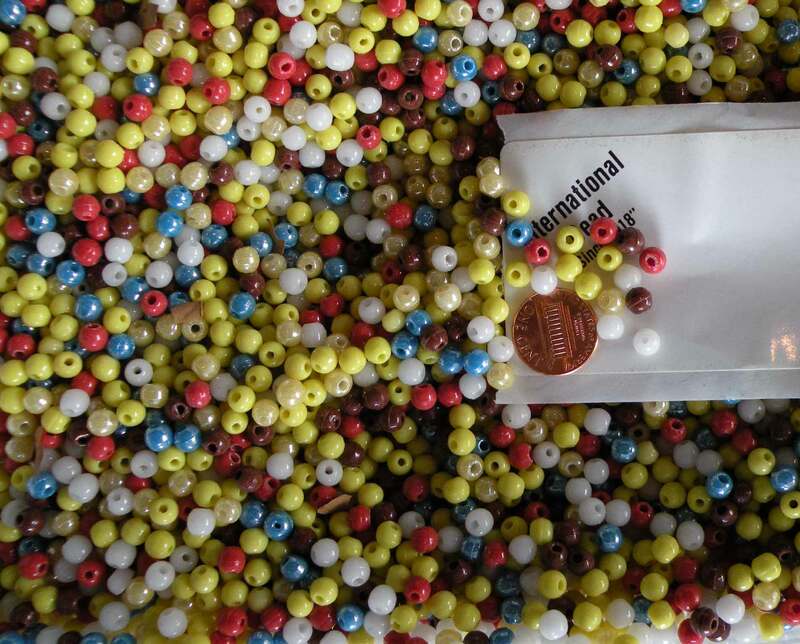 check out the original label.6mm round glass beads assorted colors in one pound bags, at least 2000 to the pound. $6.00 per pound plus shipping. 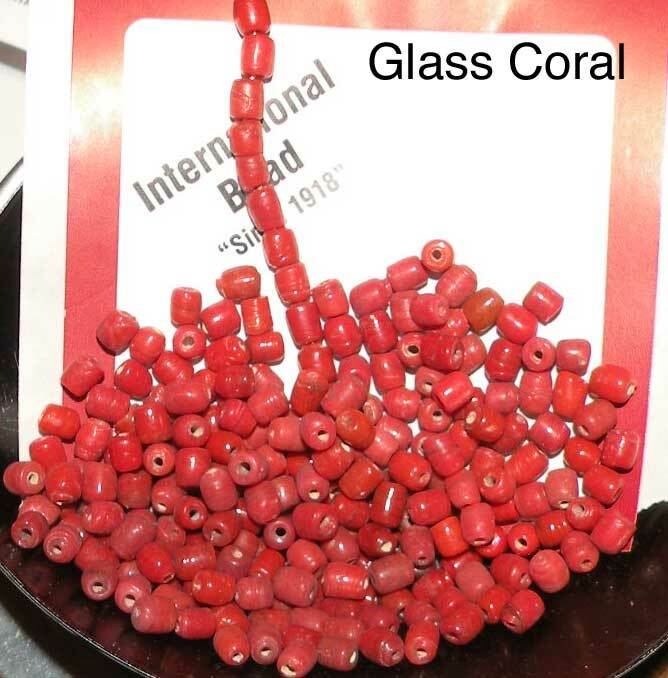 Glass imitation coral beads approx 4mm in a “roundish tubular ” shape. Looks like coral but is not. 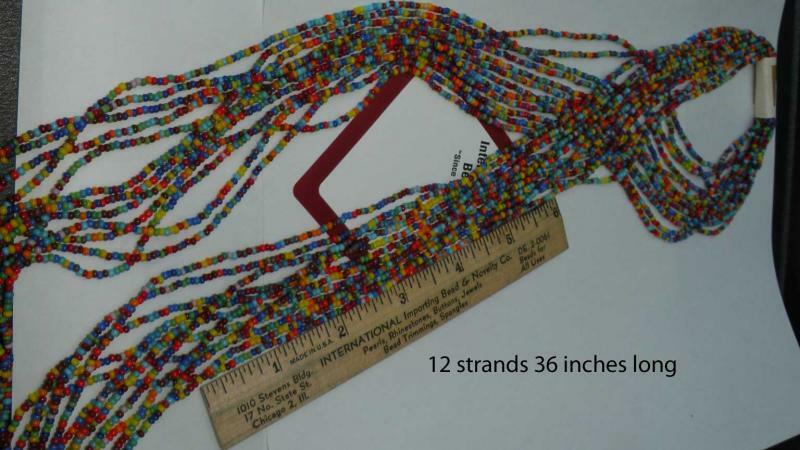 Half pound bag contains approx 1700 .pieces which strings to approximately 340 inches. 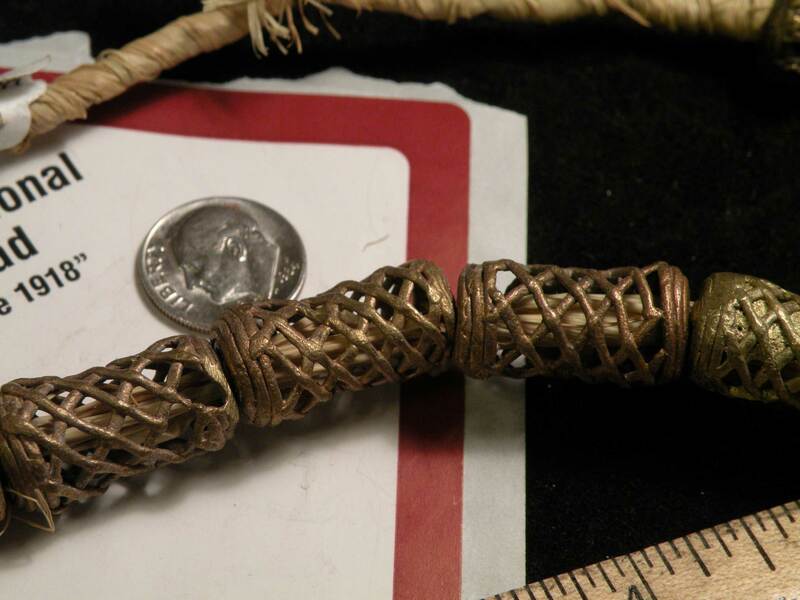 Hand Made in Varanasi India, the myths about this material abound, what I know is that they are 20 pieces for 12 dollars plus shipping. 10 pair of 5 different colors. 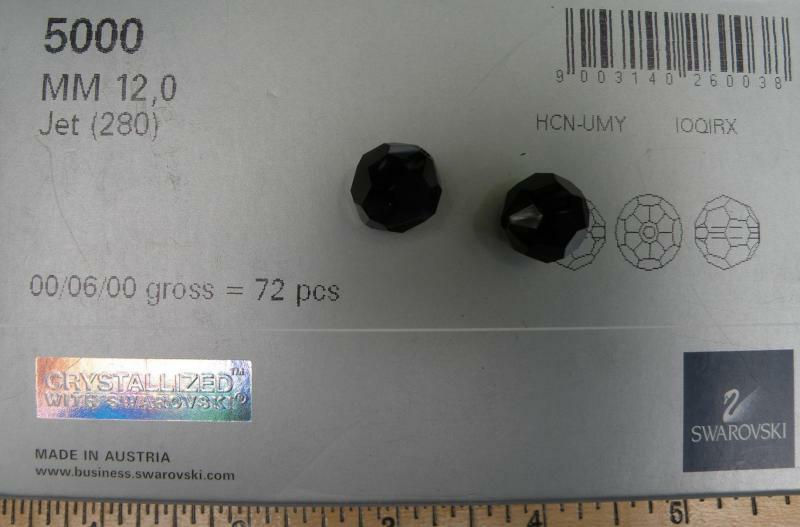 They average 12mm around 6.5 mm thick,20 pieces weigh approx. 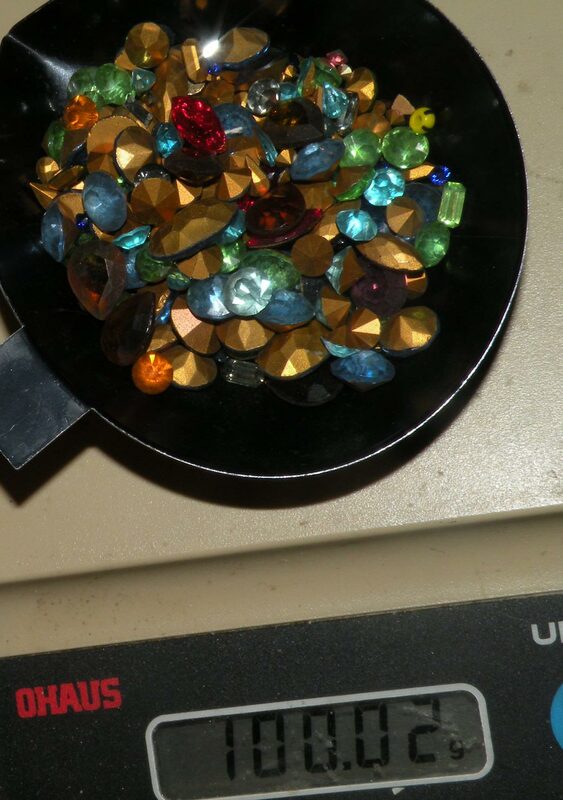 30 grams Email to order or for more information. 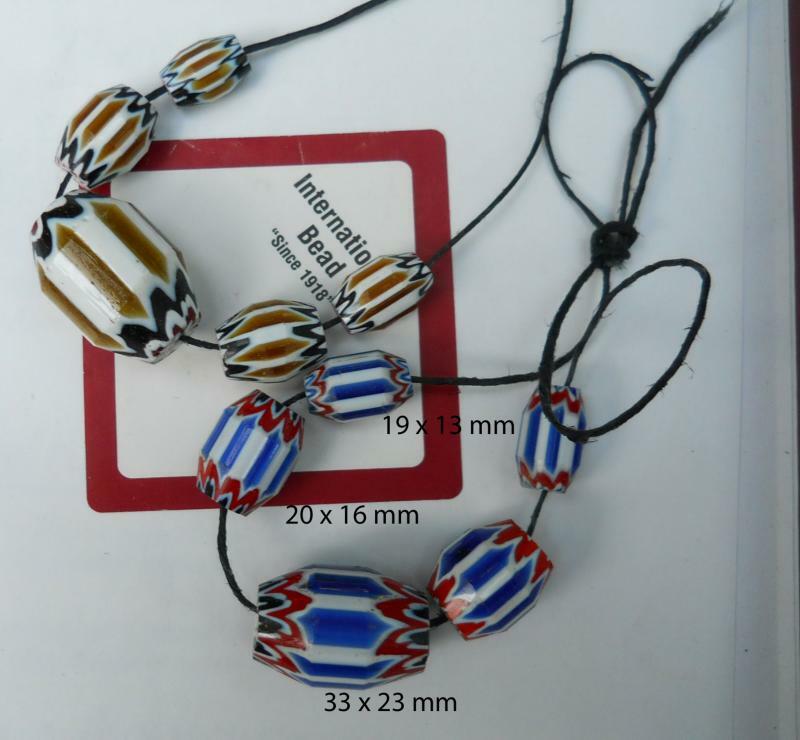 Hand Made in Varanasi They are 18 pieces for 12 dollars plus shipping. 9 pair of 5 different colors. Email to order or for more information. Hand Made in Varanasi. 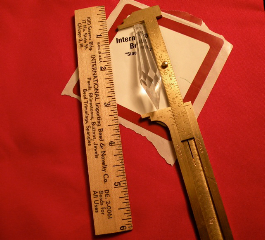 13 mm square, about a half inch. Drilled along the corner. 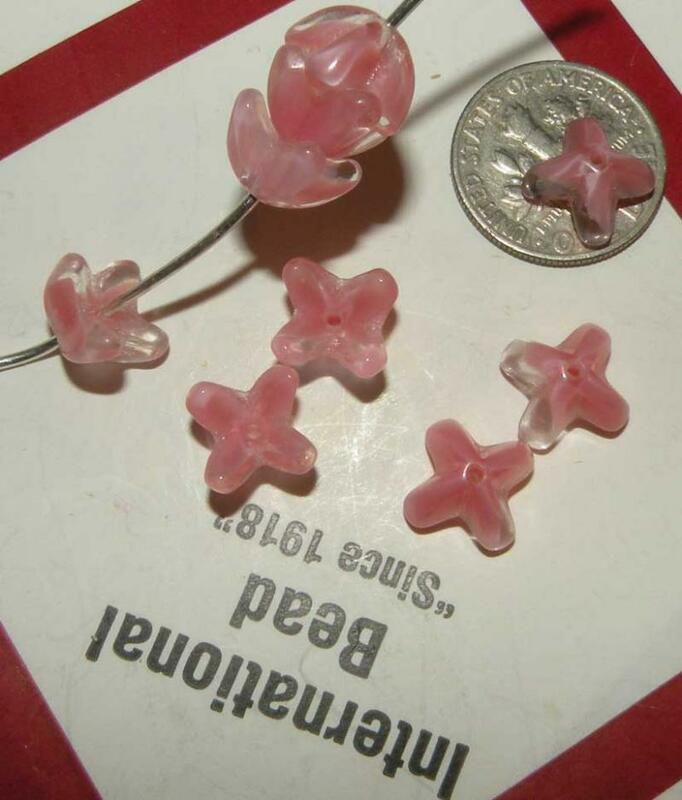 They are 8 pieces for 12 dollars plus shipping. 4 pair of 4 different colors. 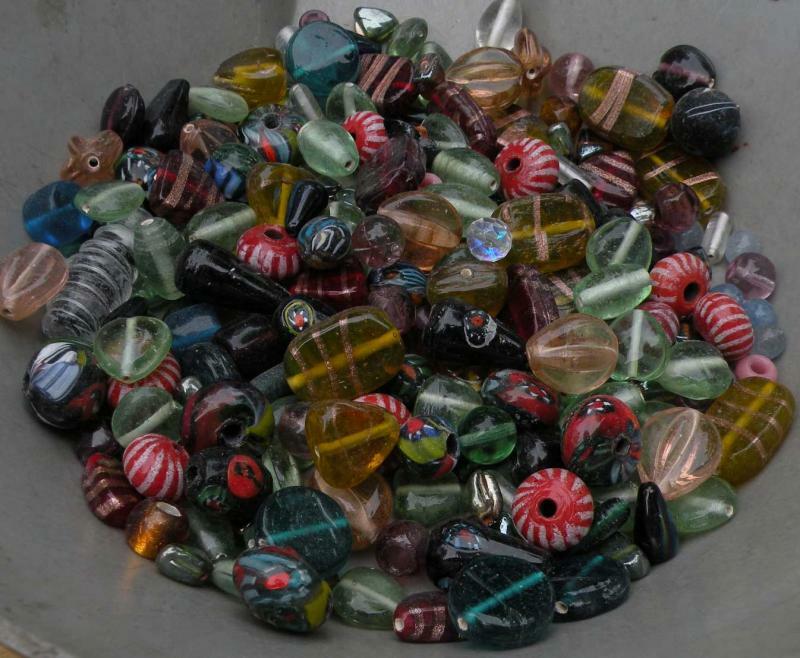 Glass “Eyes of Saturn” bead, handmade in India 8mm around, 50 assorted colors $4. Email to order. The Ben Haller Plastic Mix. The Emma and Isabelle Sequin Mix. 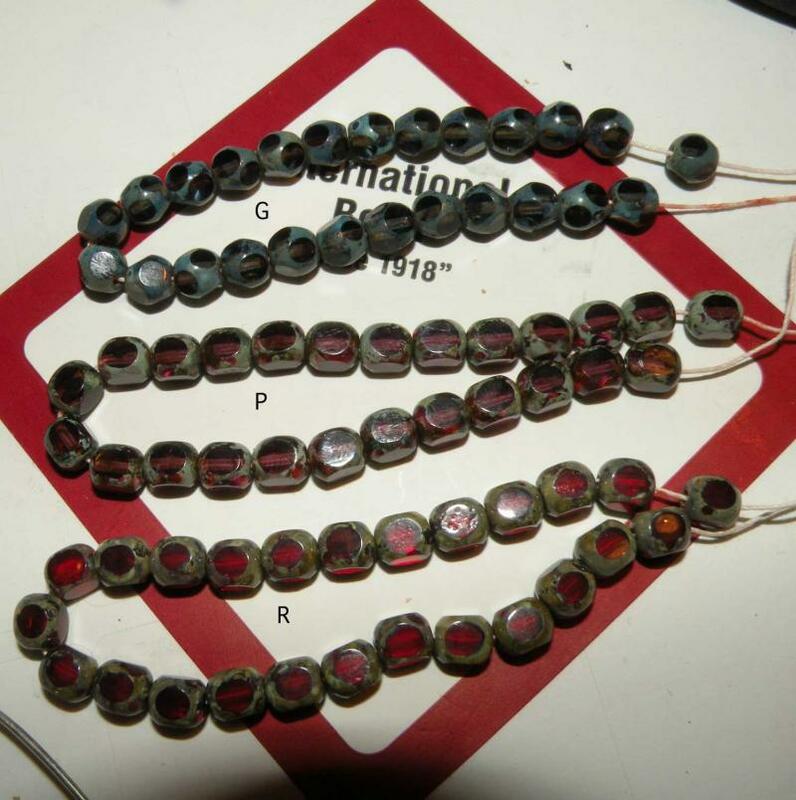 Pre war sequins, from the 1930’s , maybe older.. A mixture of unusual colors , including some very old metal ovals, made in France and hand packed into small paper wraps. 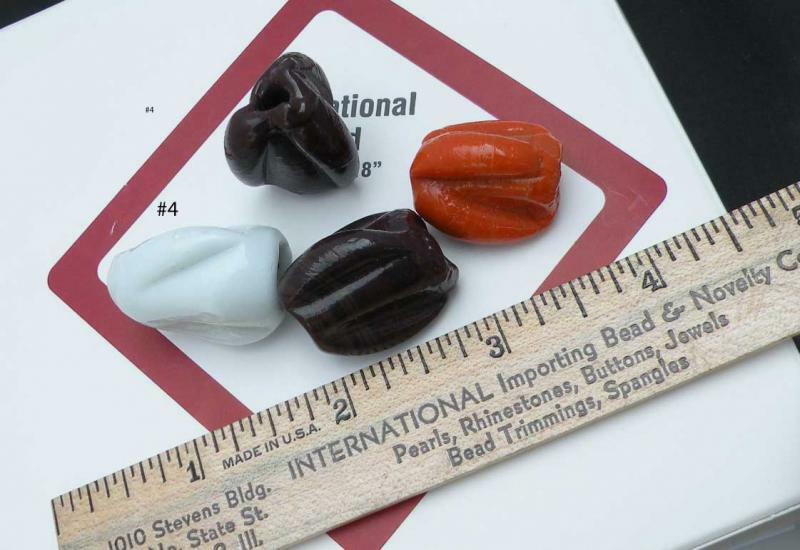 The mix includes the notorious Belgian Black Hearts. 1 tablespoon, weighs at least 10 grams. Each spoon full will vary, but not very much. $6.00, plus shipping. Limited Quantity. Email to order. 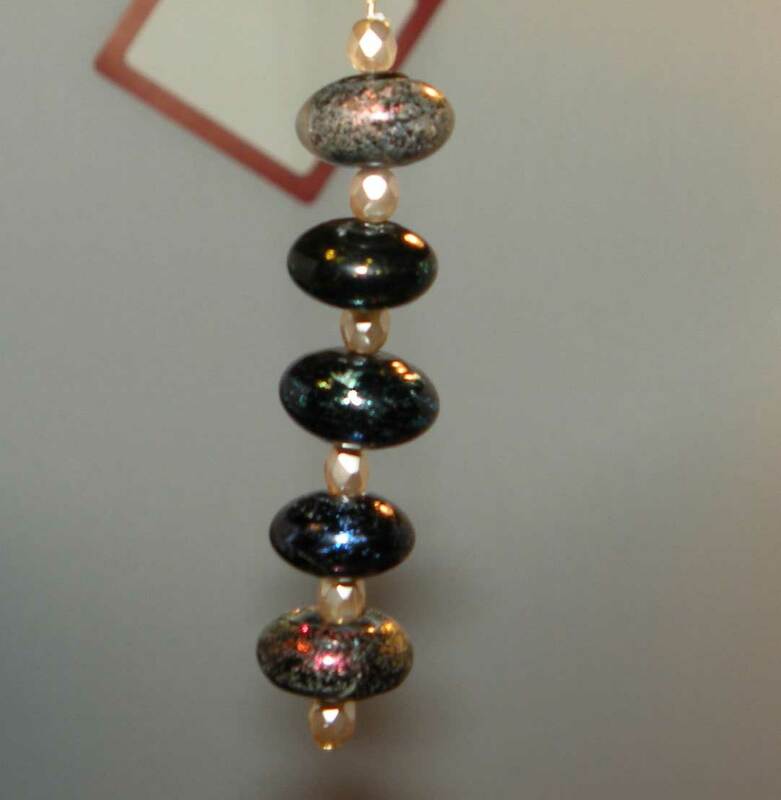 Recently made in the Czech Republic using Preciosa stones. 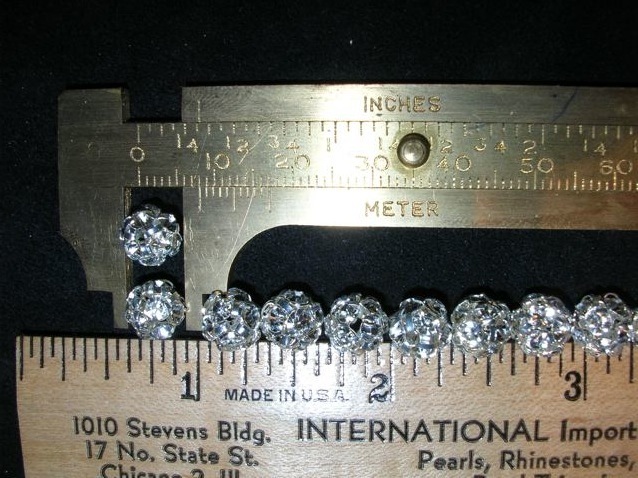 8mm beads made of Rhinestones as in the photo. 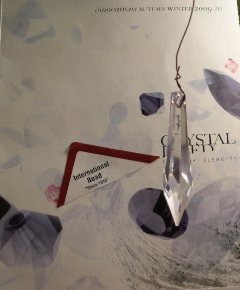 Crystal stones set in Silver color metal. 1 bag of 24 pieces. 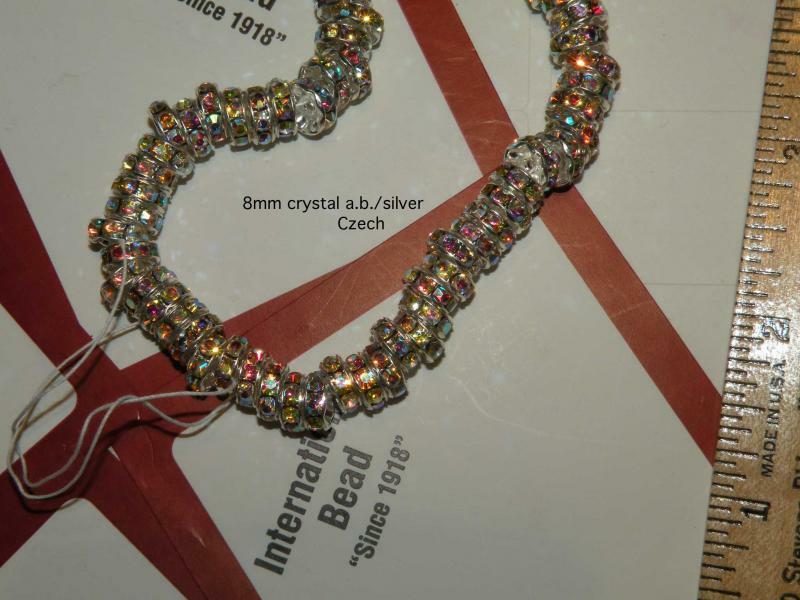 Preciosa Rhinestone Chain, A crystal silver 3mm stones $5.00 per yard-A is sold out! 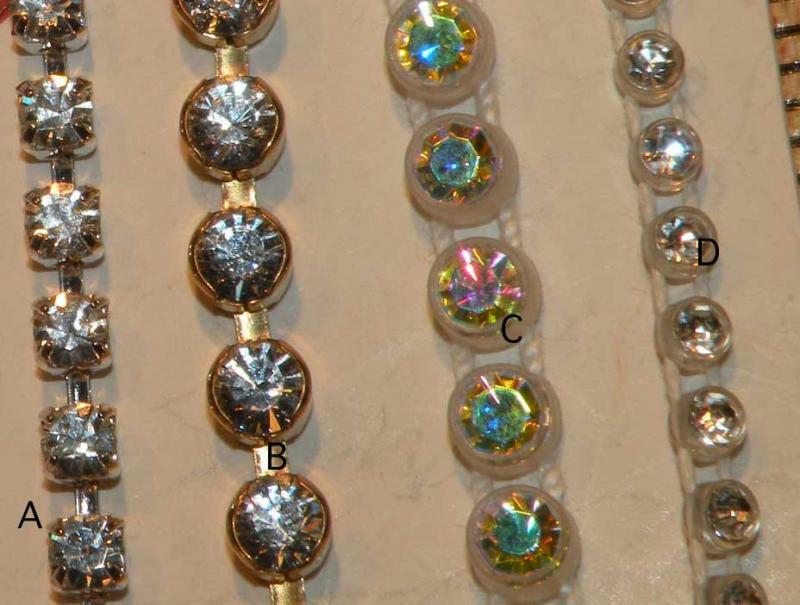 Swarovski Rhinestone Chain set in Round cups, B gold plated size ss18 crystal stones. 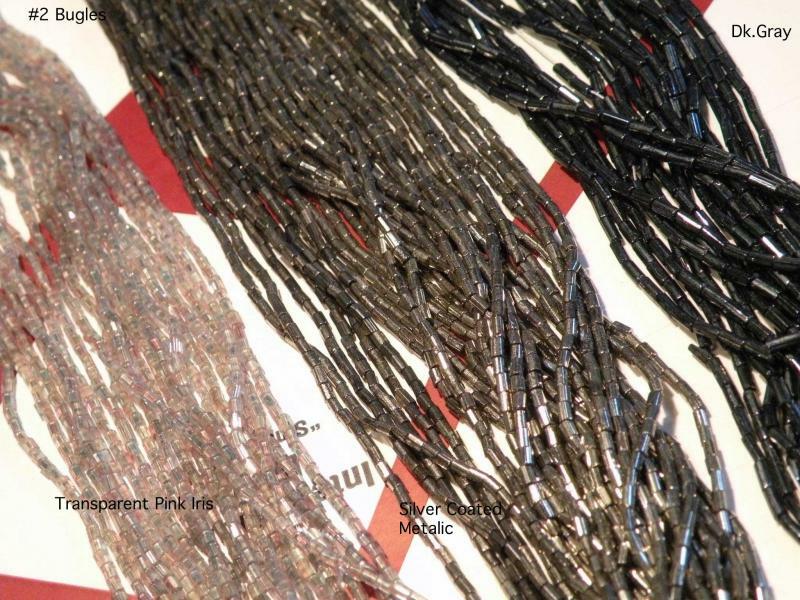 $12.00 per yard. 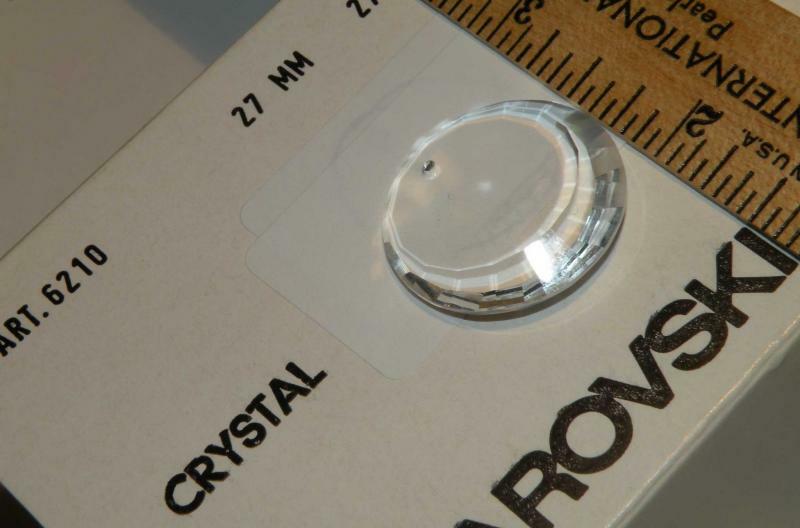 Article 8550 40mm single cut. 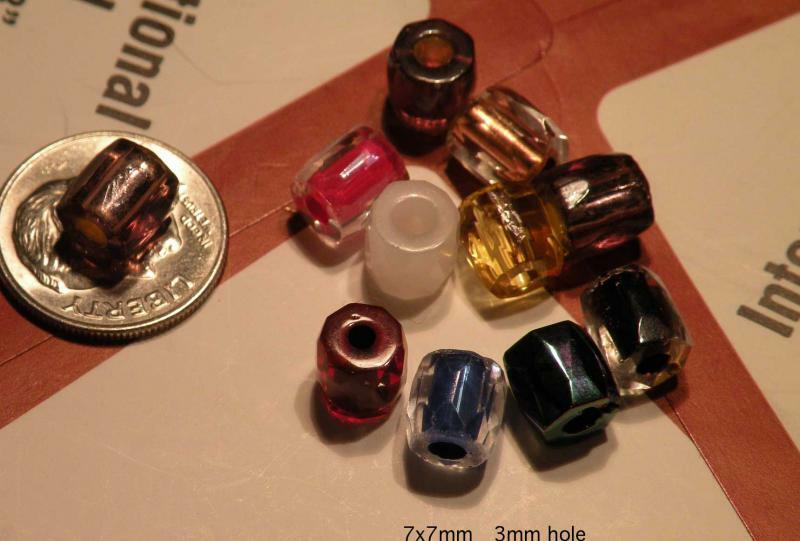 8mm Rhondelle Crystal A.B./Gold Czech 18 pieces $6 plus shipping. Preciosa Article 2570 Czech 12mm pointed back stone . 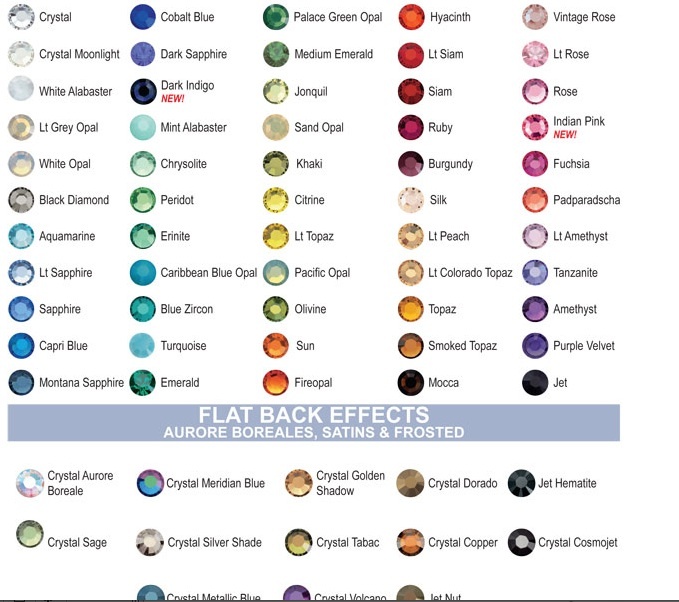 in two colors- Crystal a.b. or Vitrail Medium. 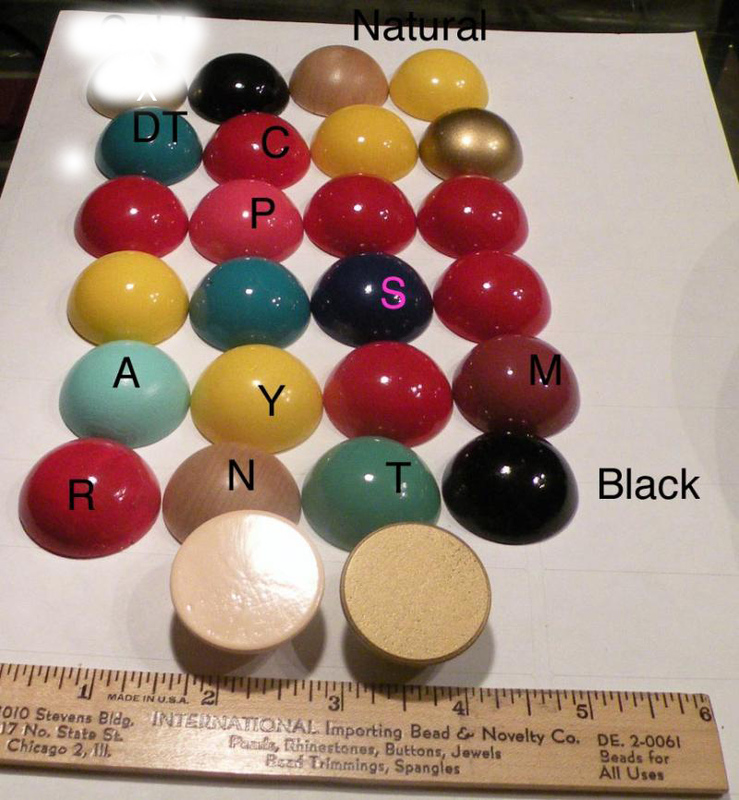 The photo shows both sides of the stone. $4 per dozen, mix or match the colors. Email to Order. 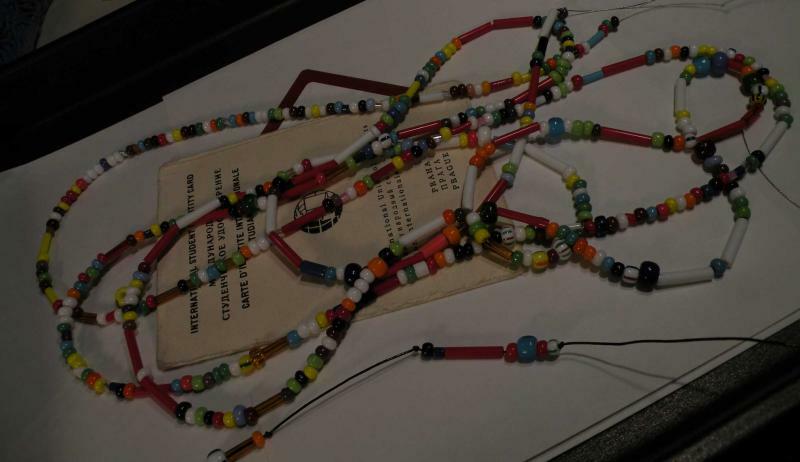 We called them “Earth Beads” . 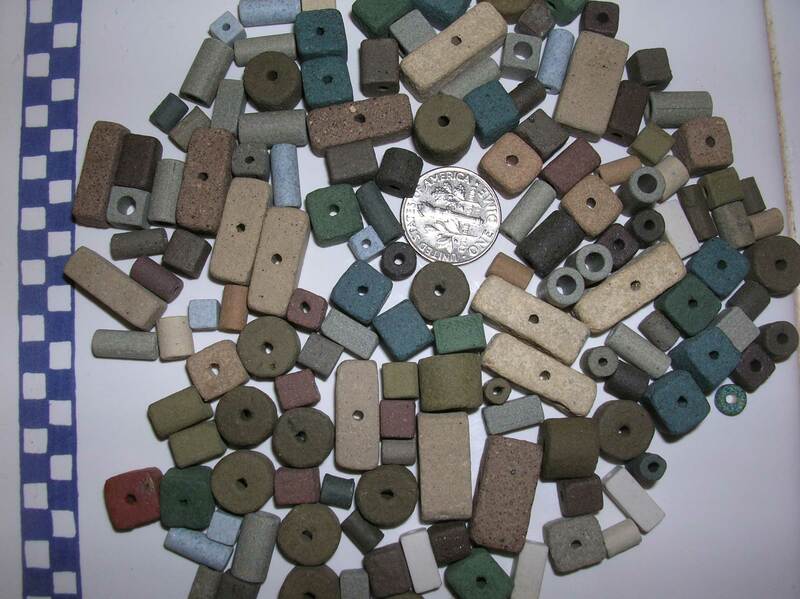 Made in the U.S. -in Chicago, in the late 60's, they are some sort of super- hardened clay with a rough surface, in earth tone colors. 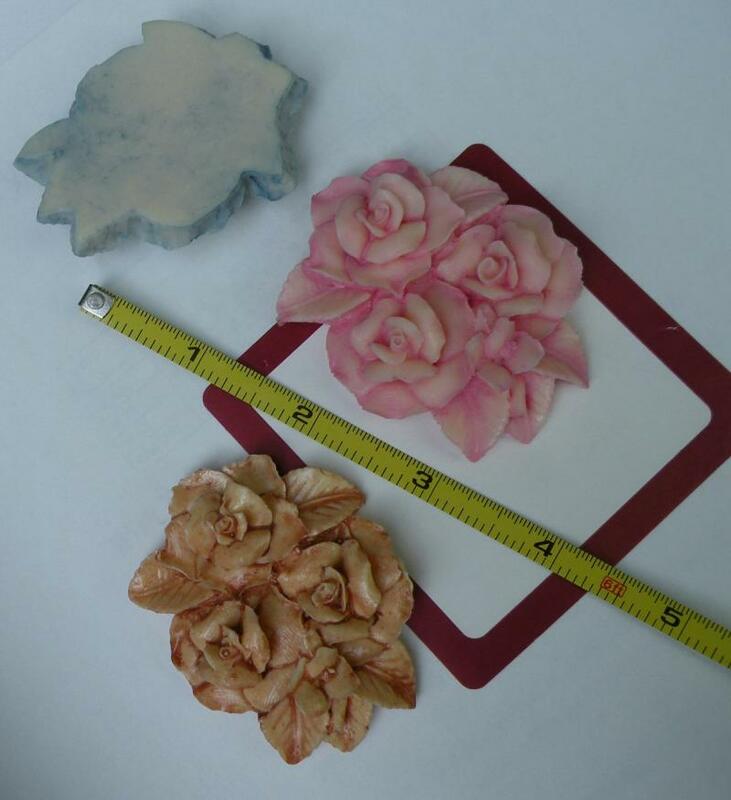 Assorted shapes, some with larger holes. 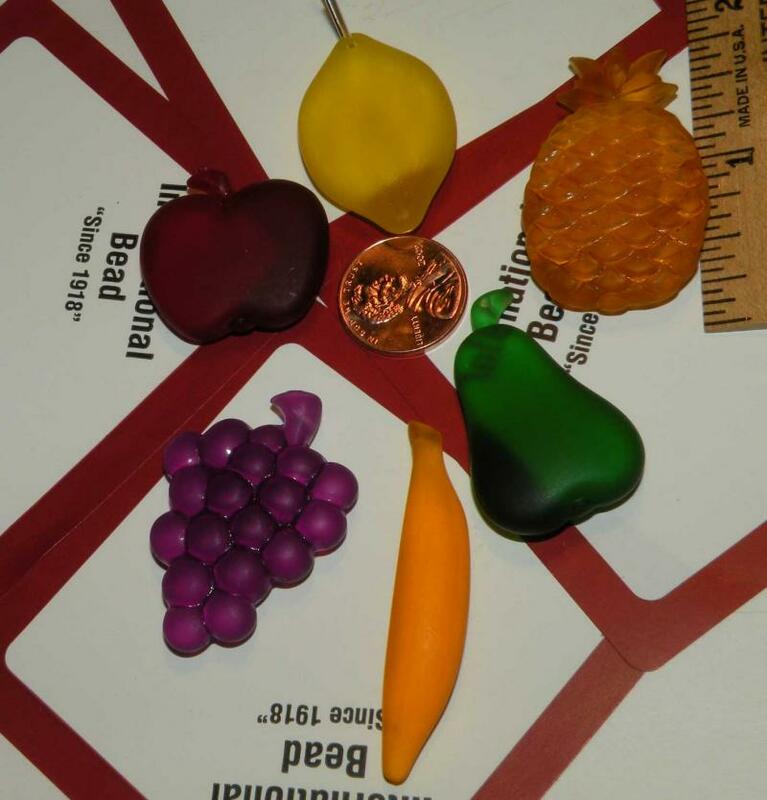 4 oz package with a random assortment, each bag will be different. In the picture a typical bag. 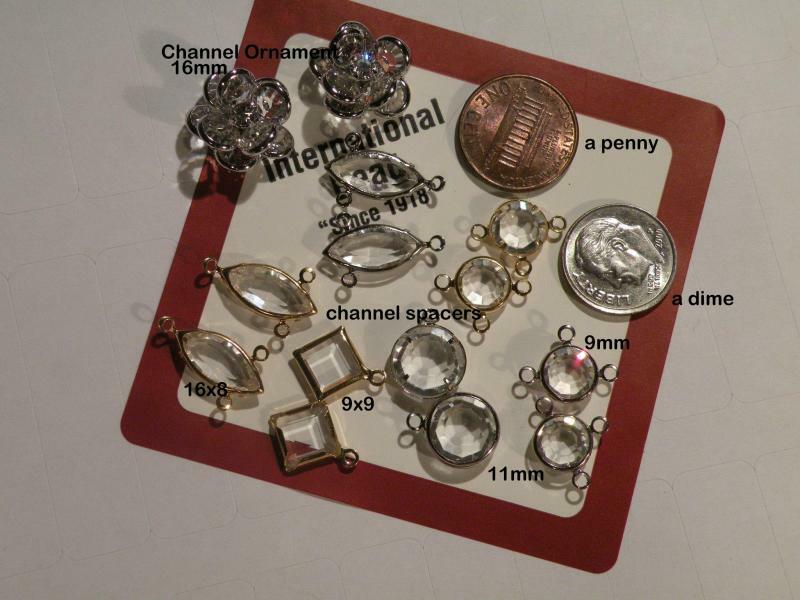 I counted 140 pieces , the dime is to show the size perspective. $6.00 plus shipping. 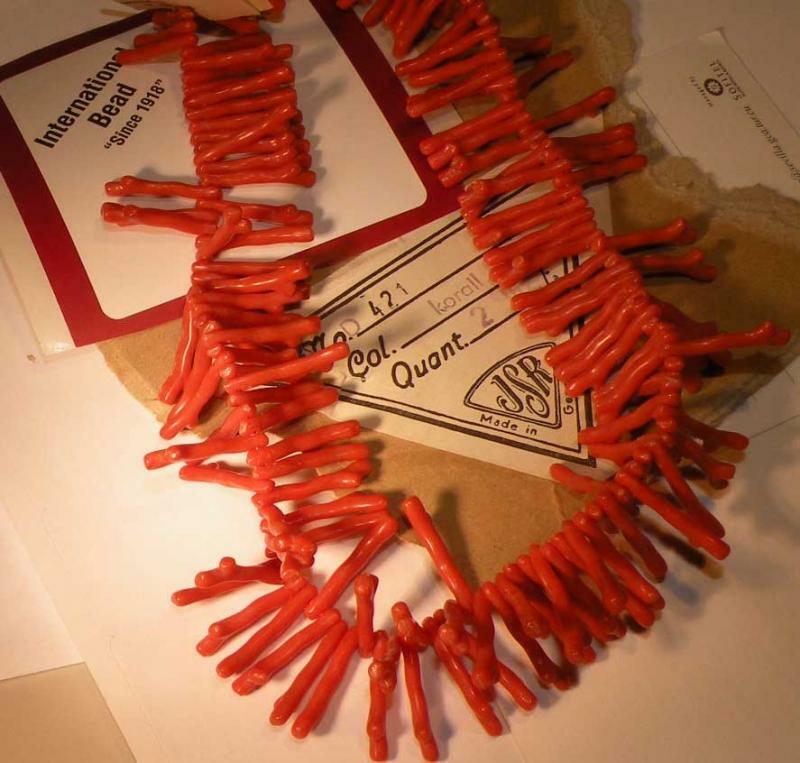 Fifty 38 mm long bugle beads, the kind that were used on lamp shades, and fifty 8mm Round Red sew-on Nail Heads, intended to be sewn onto flapper dresses. 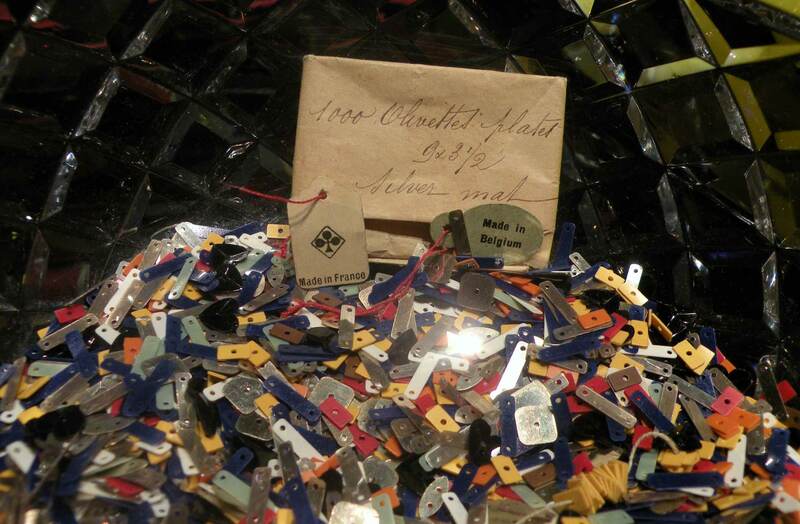 Made in Czecho-Slovakia, in the 1930’s. $3.00 plus shipping. Czech and German, weighs 100 grams. 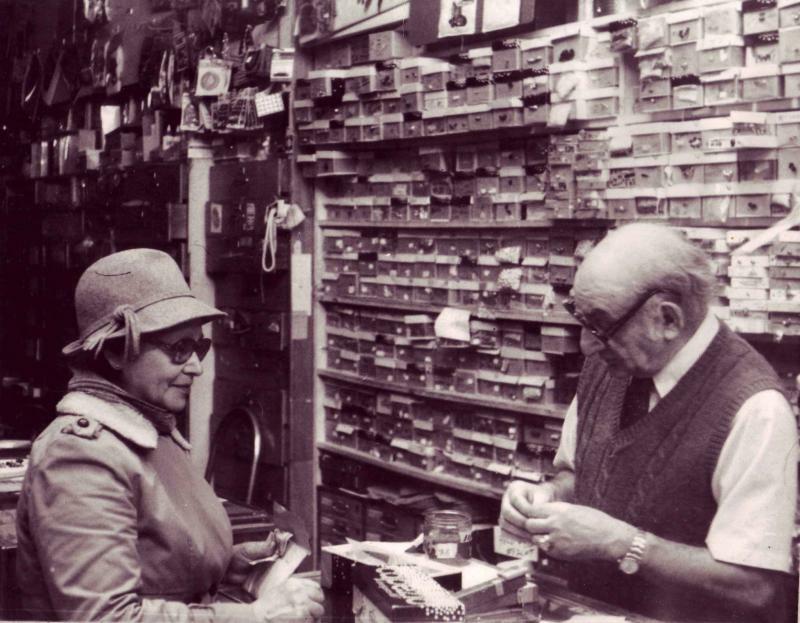 more than 50 years ago they were made for jewelry, Glue them on the corners of a picture frame or put them in a jar. No Rules of usage and if there are any rules... no enforcement. $9.00 plus shipping. email to order or for more information. No Rules Jewels uncovered. 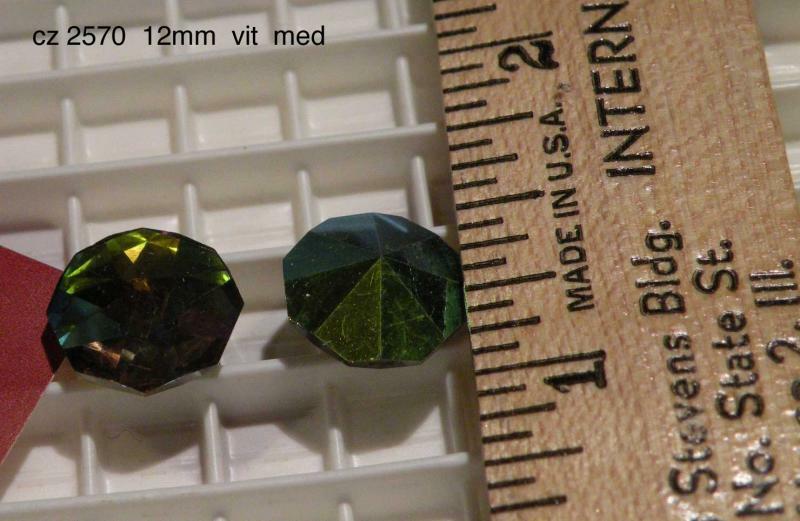 The very same jewels with the foil removed. Do it yourself or order them unfoiled. 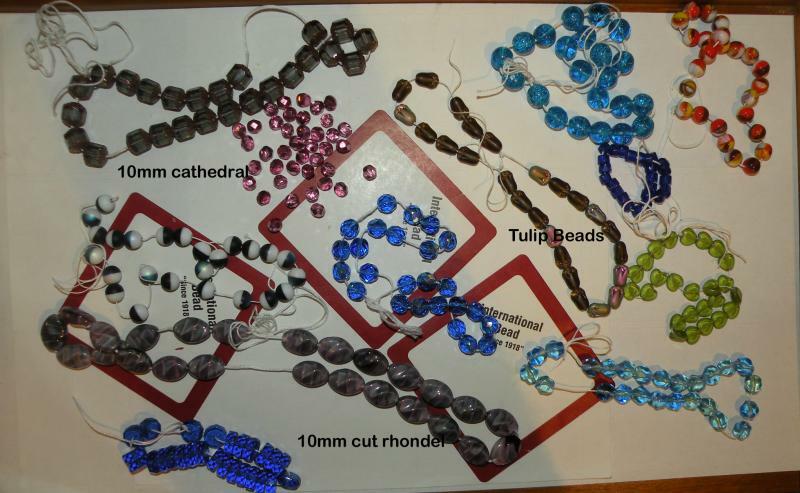 Instructions for easily removing the foil come with each order of the foiled jewels, for us to do it there is a charge.